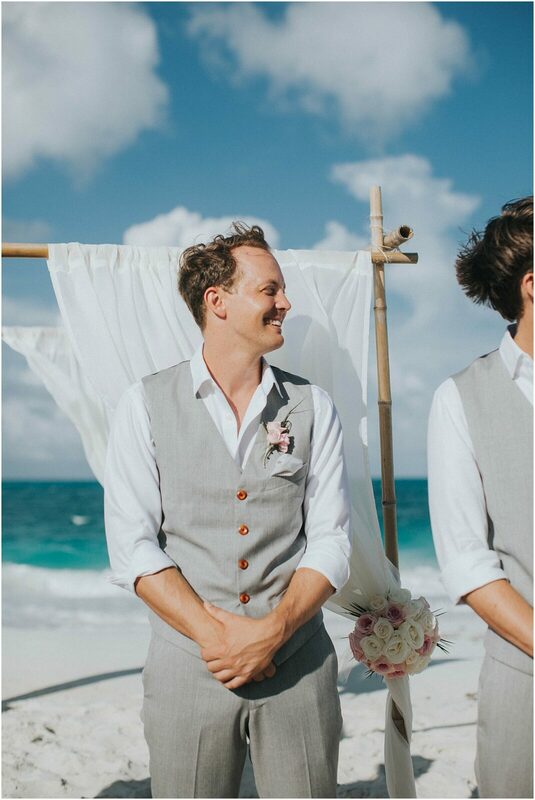 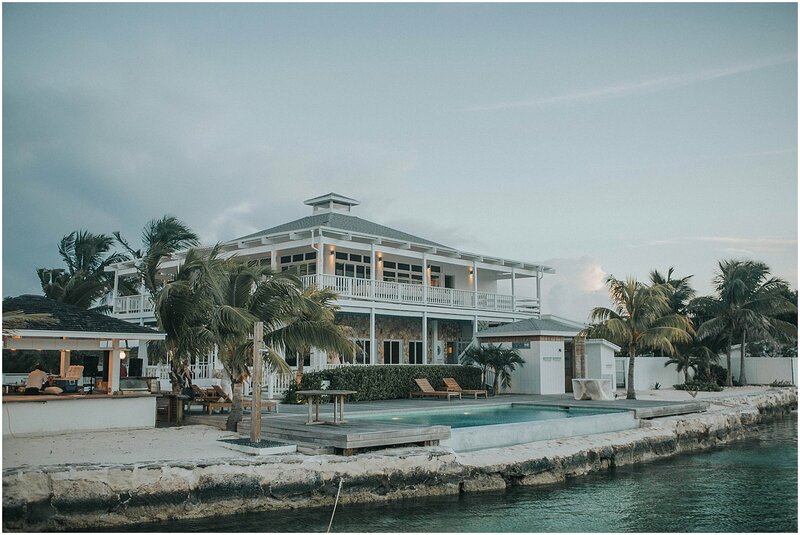 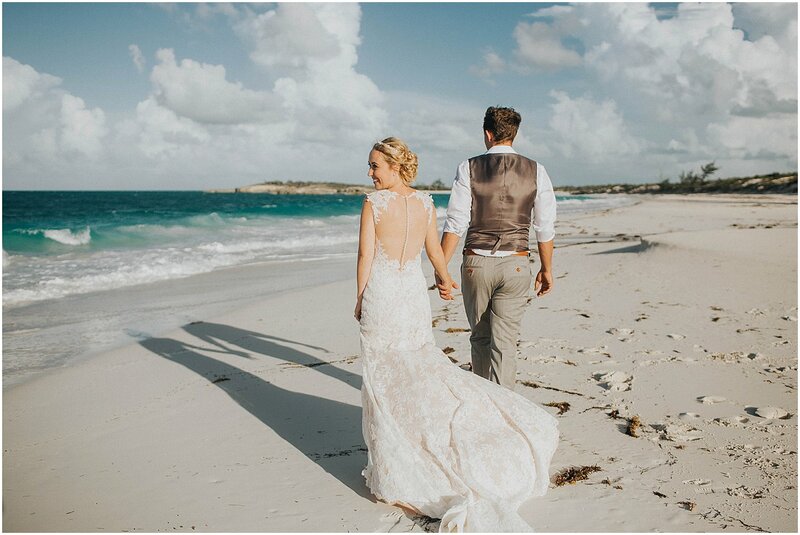 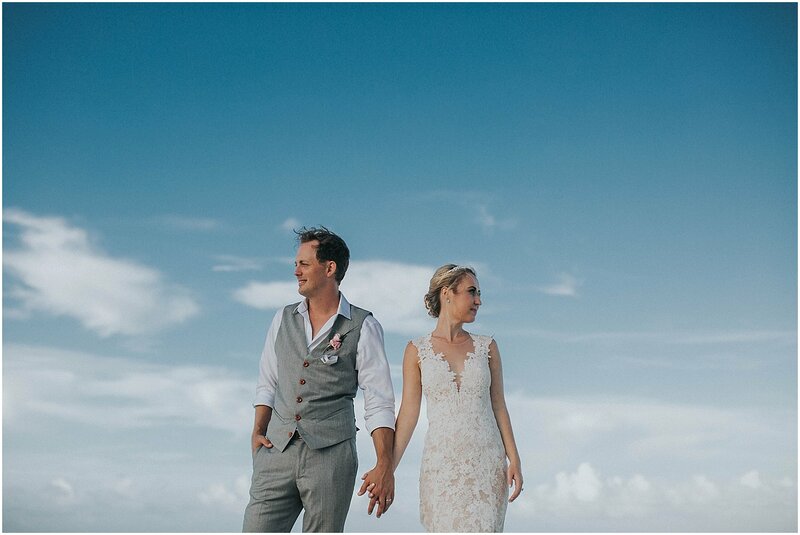 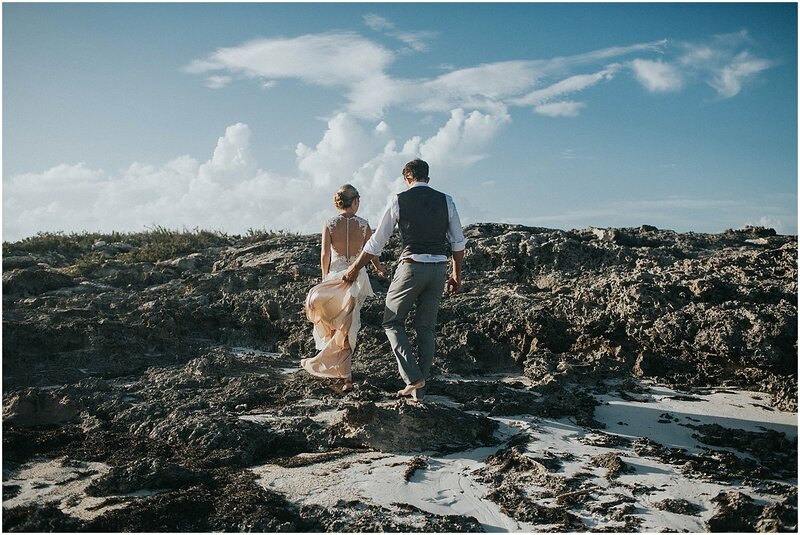 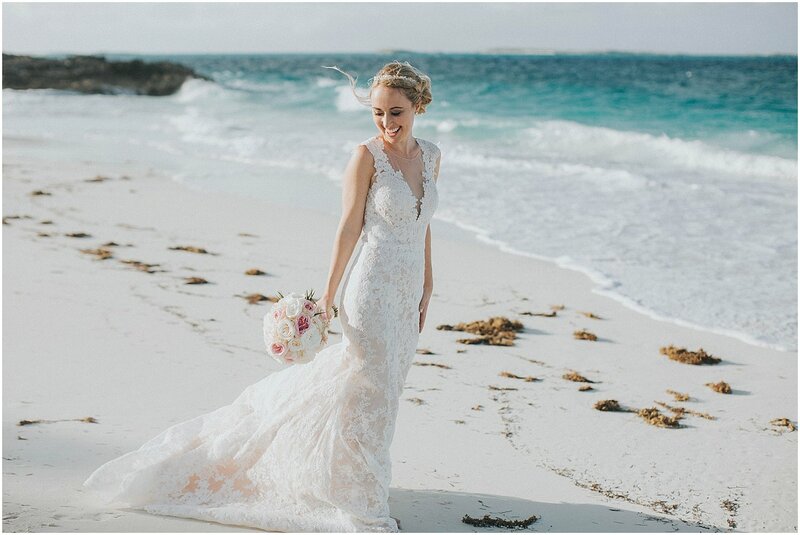 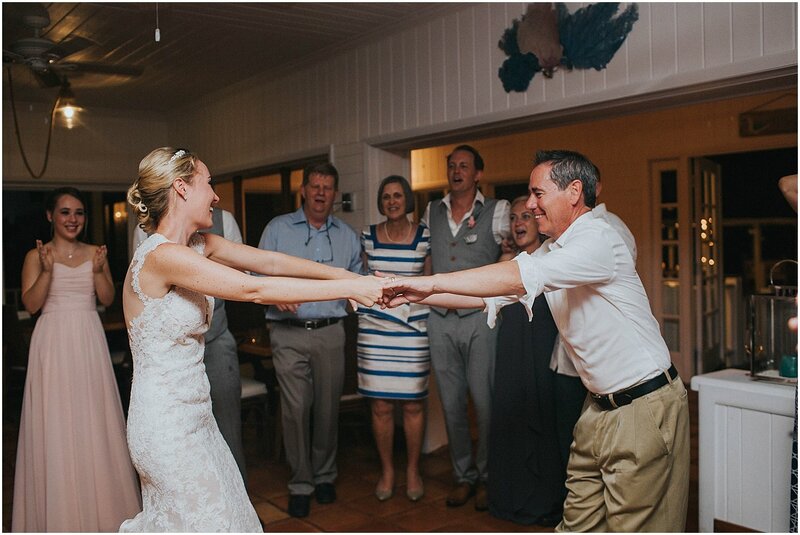 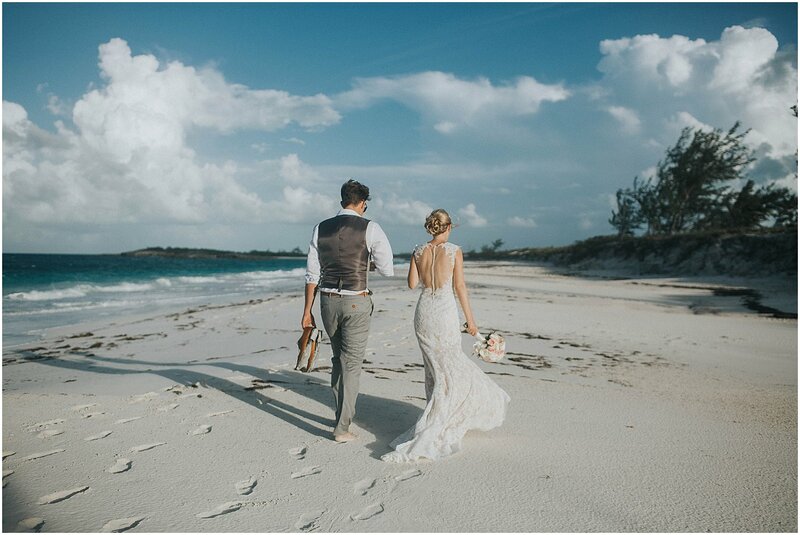 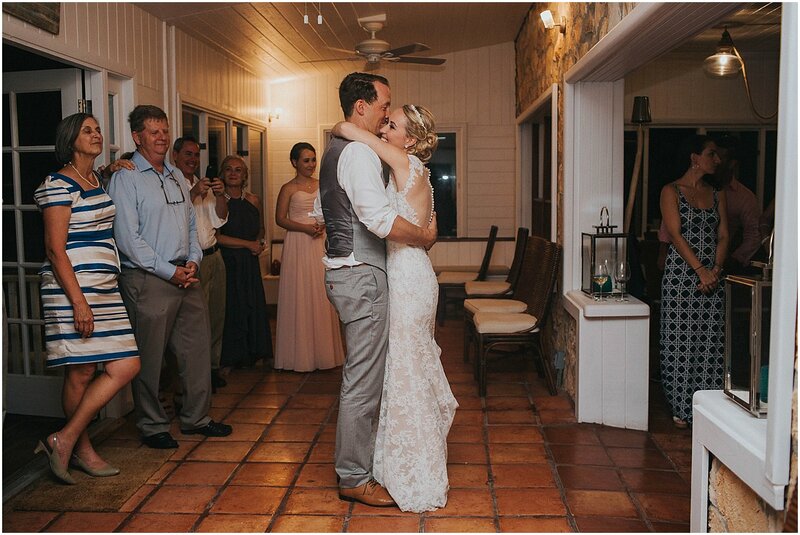 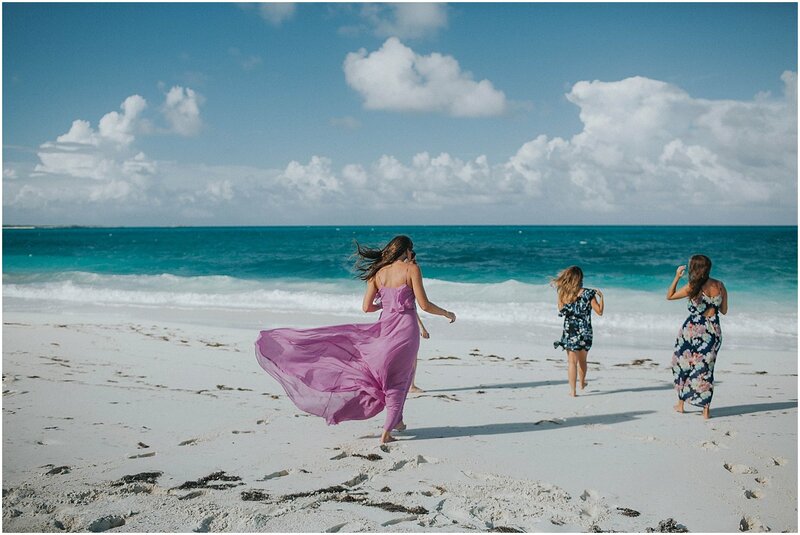 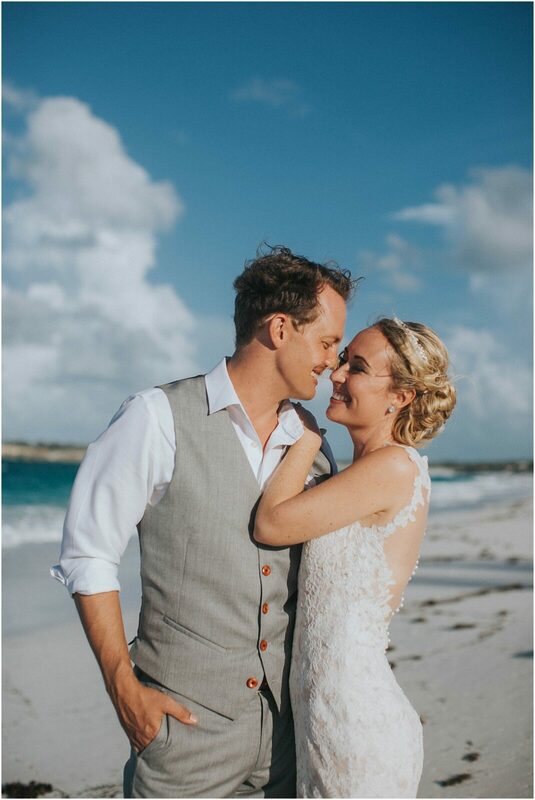 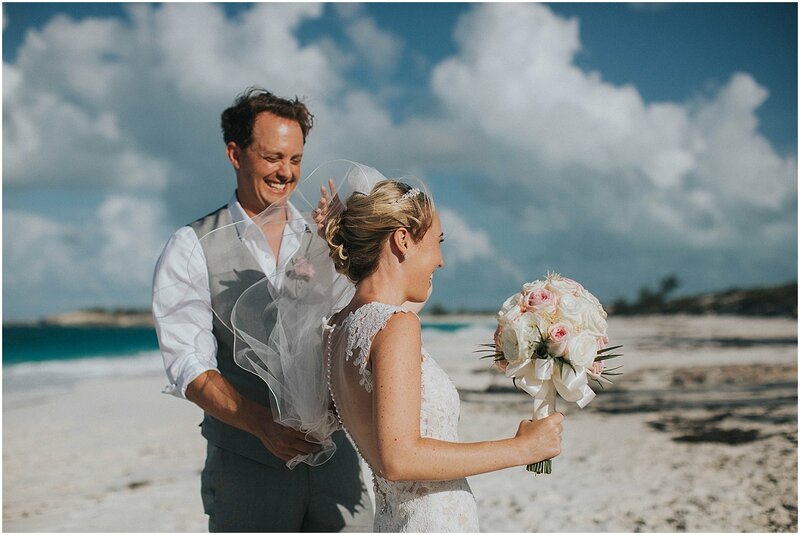 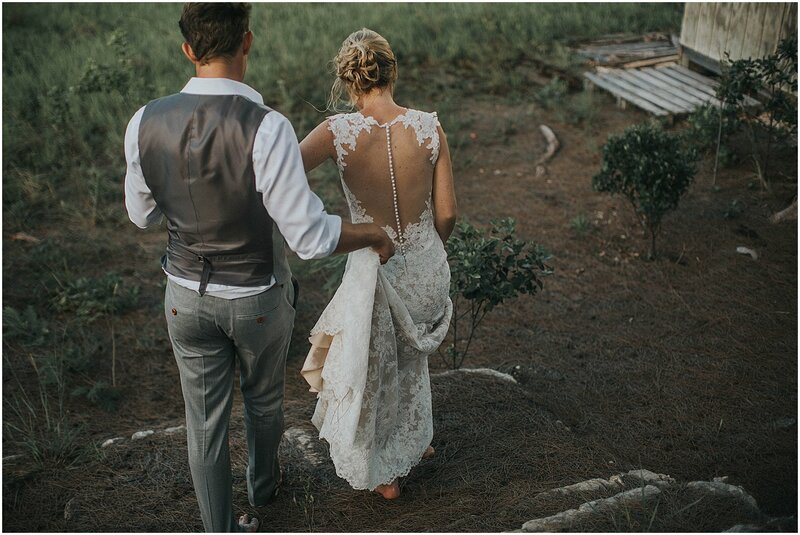 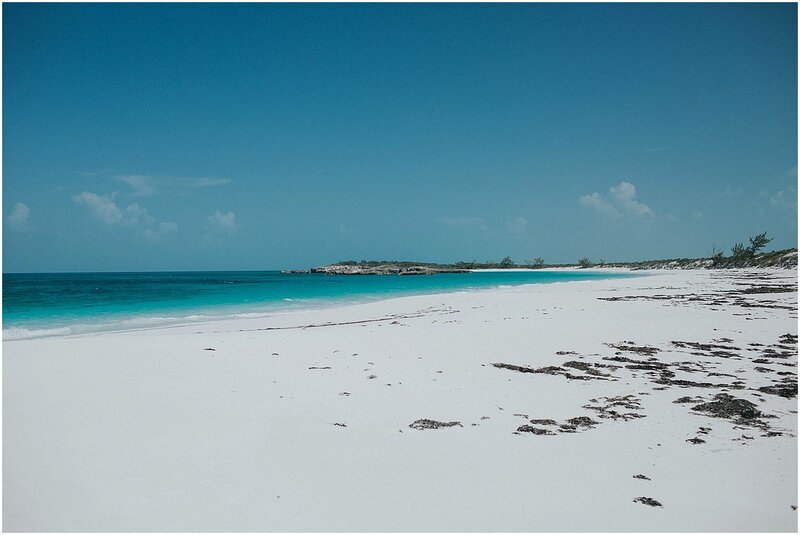 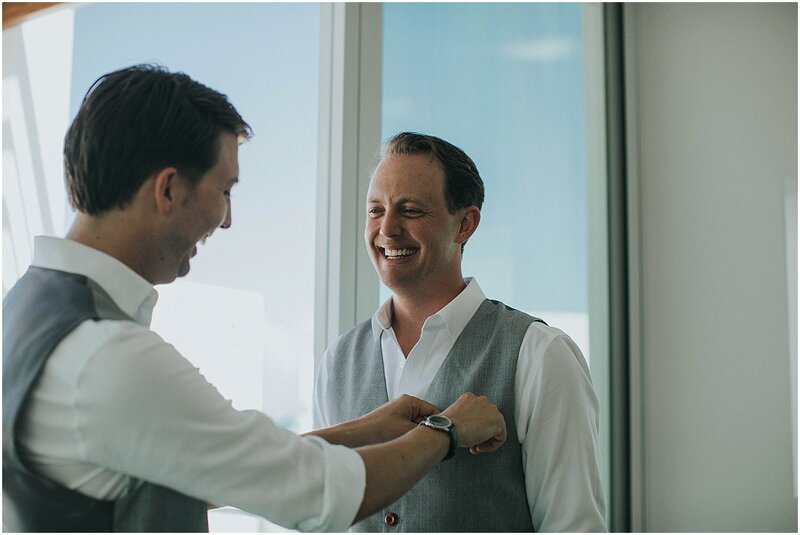 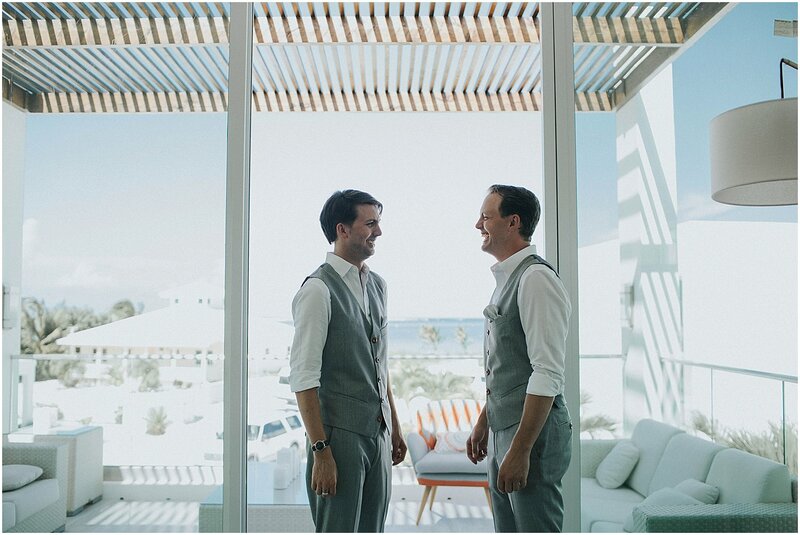 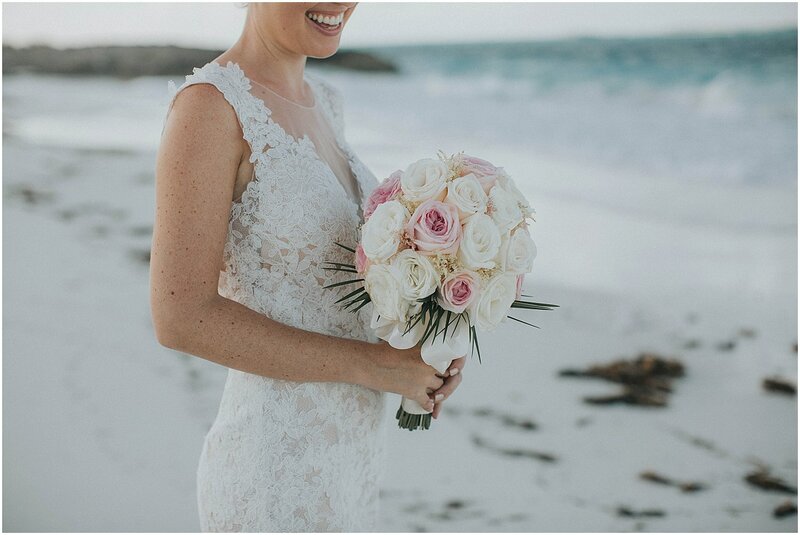 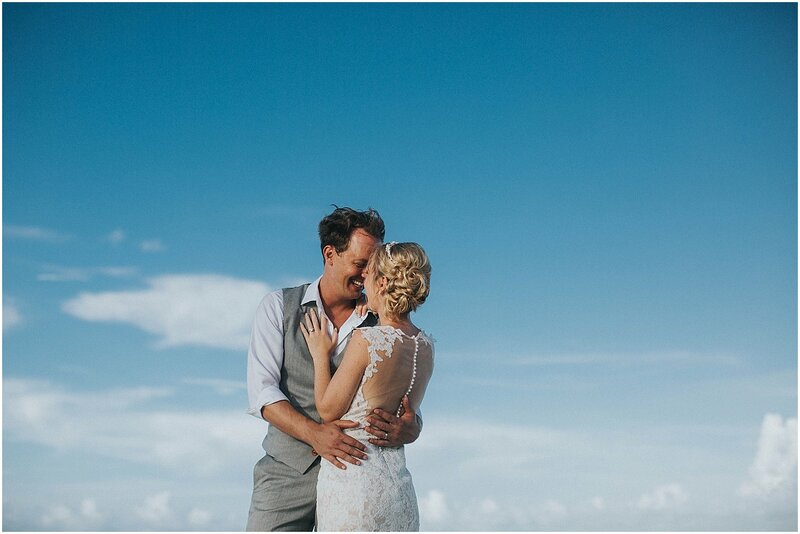 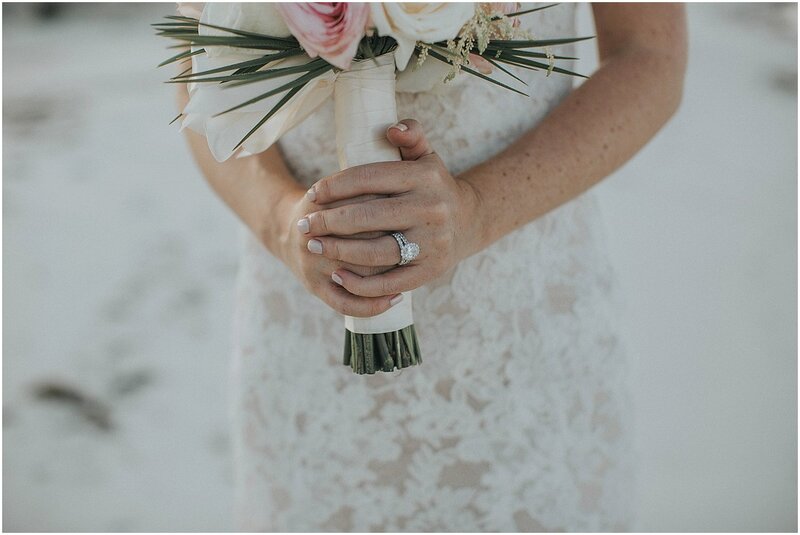 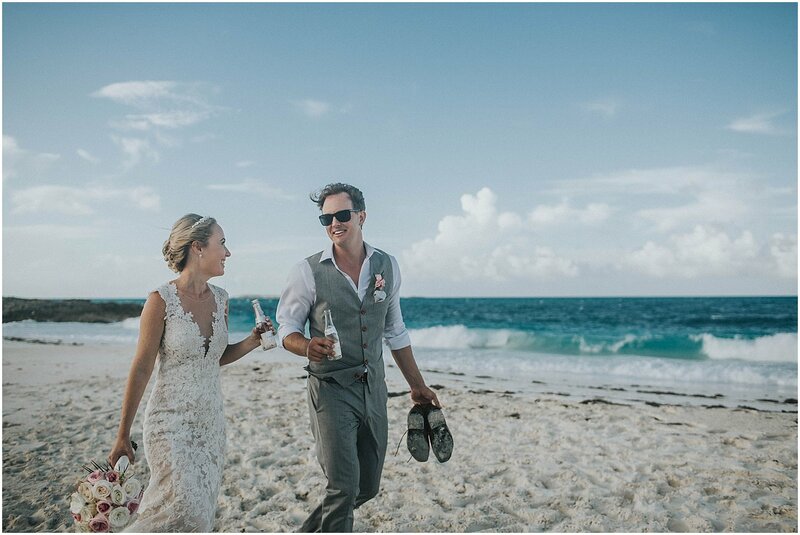 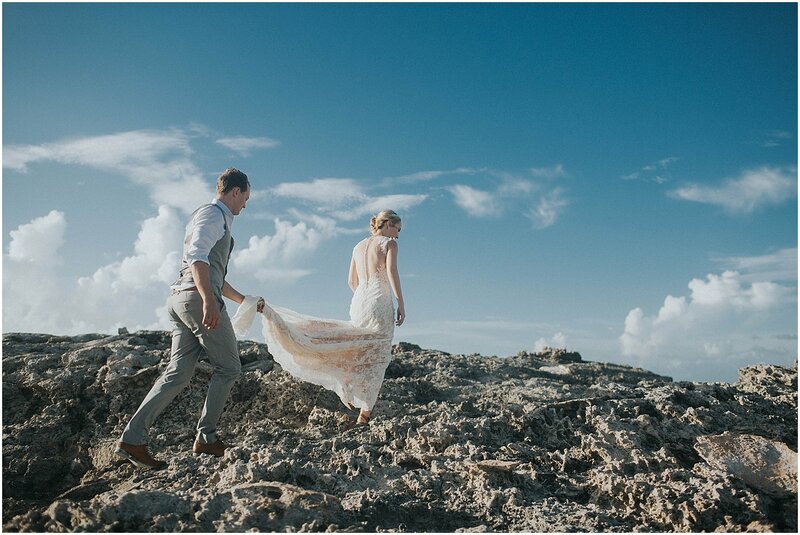 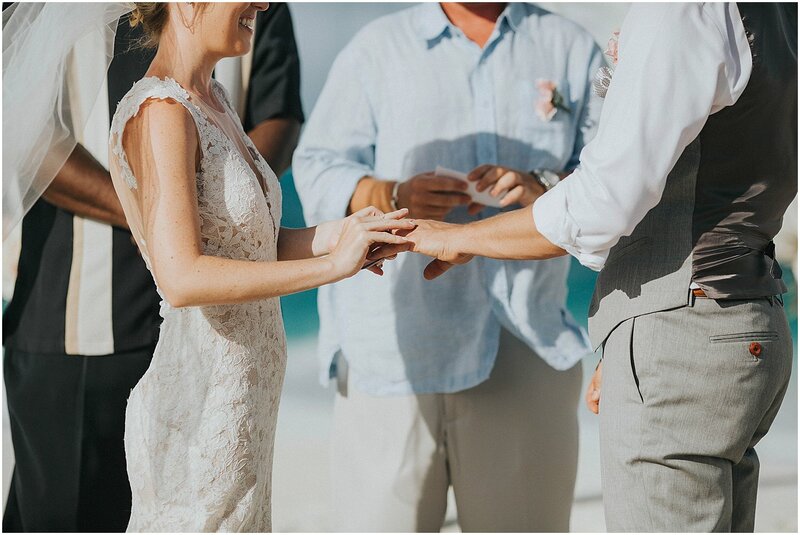 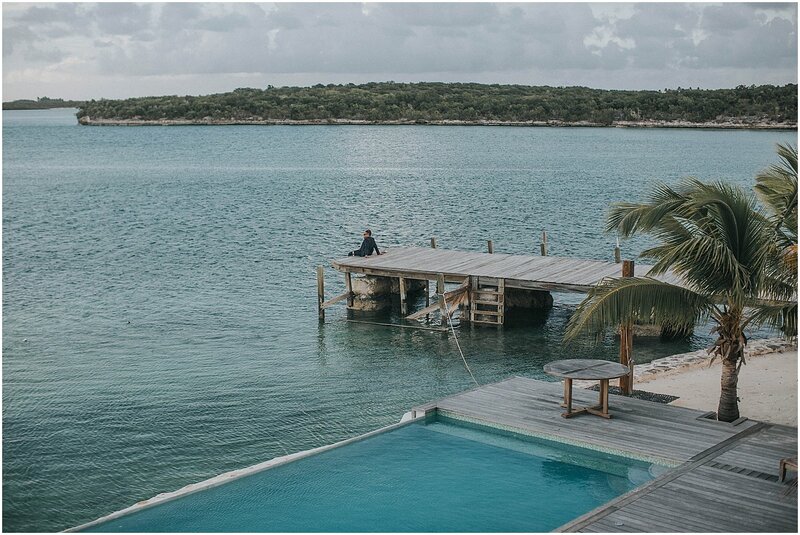 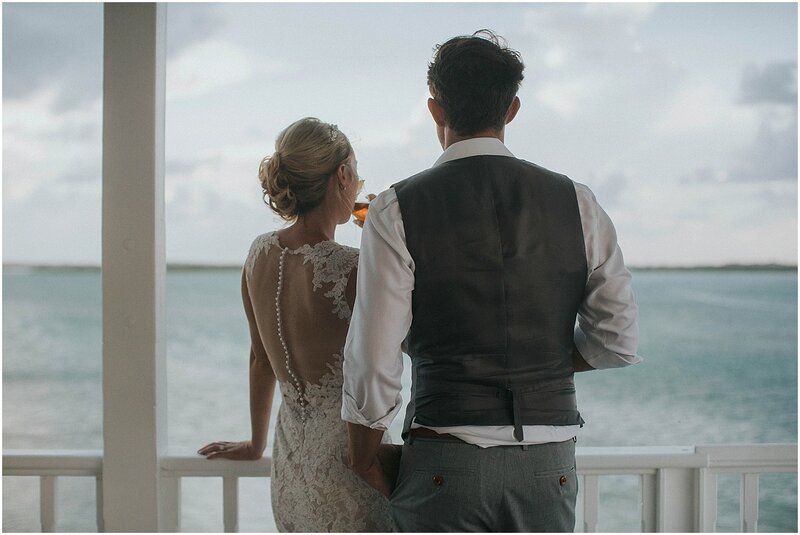 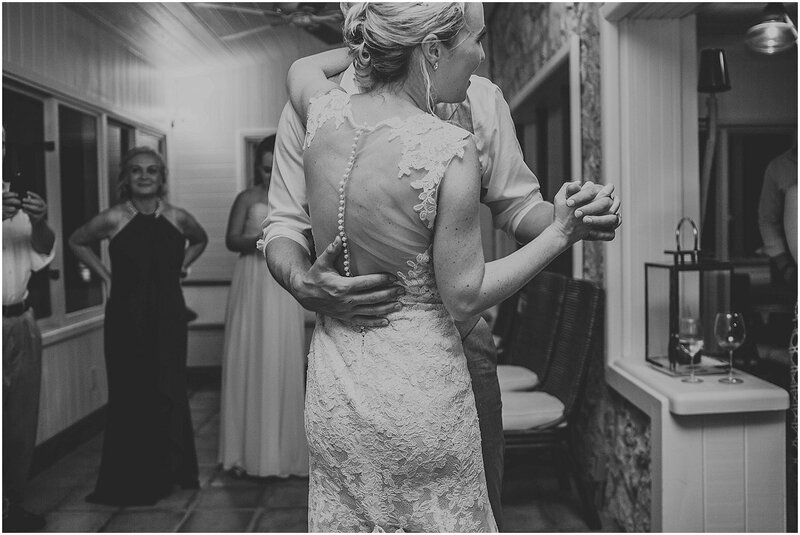 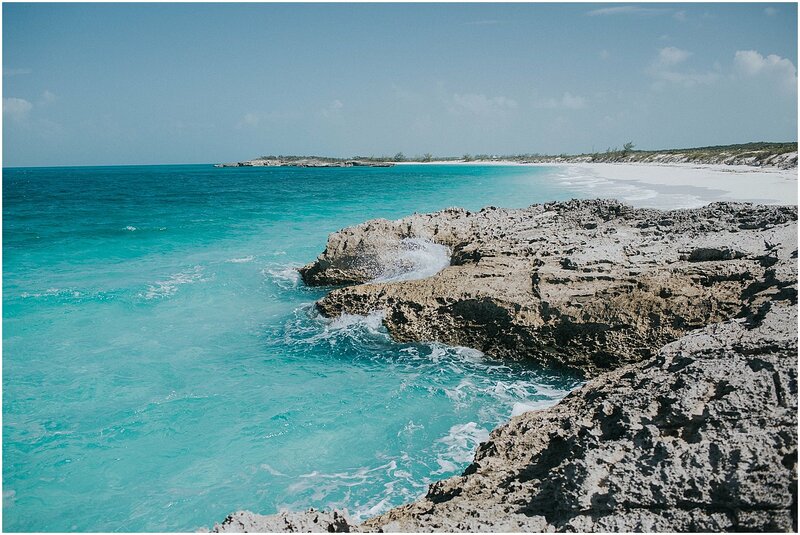 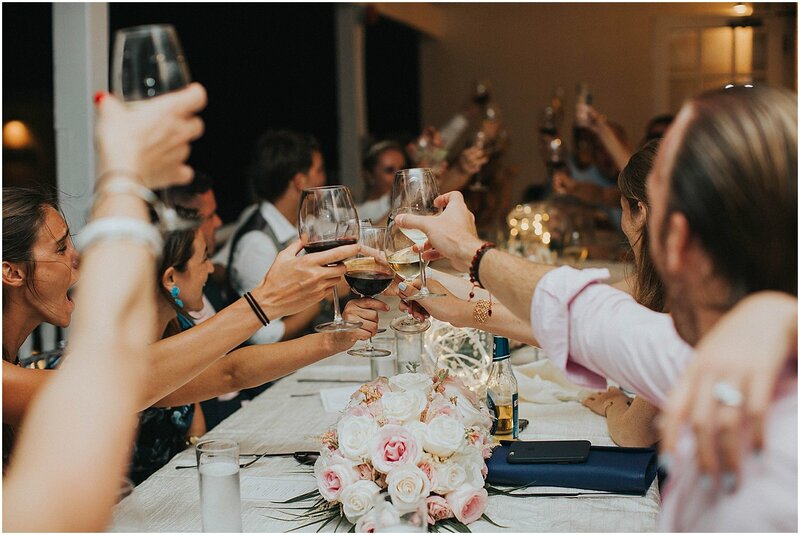 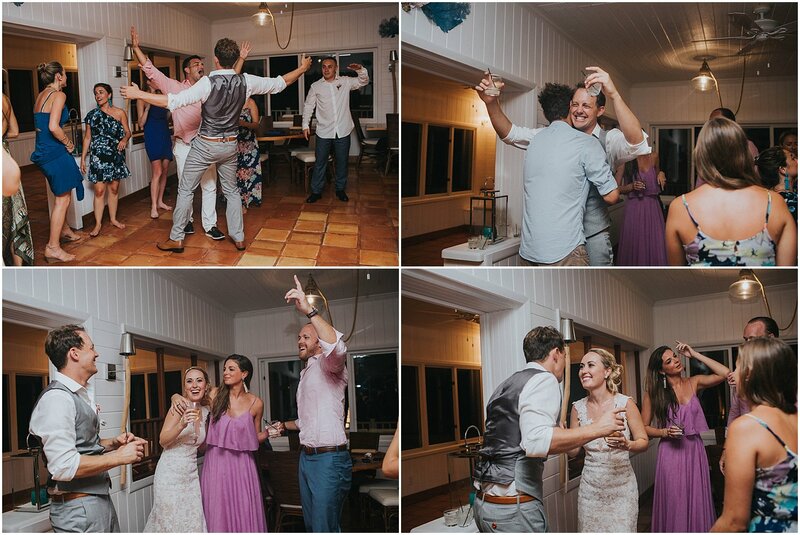 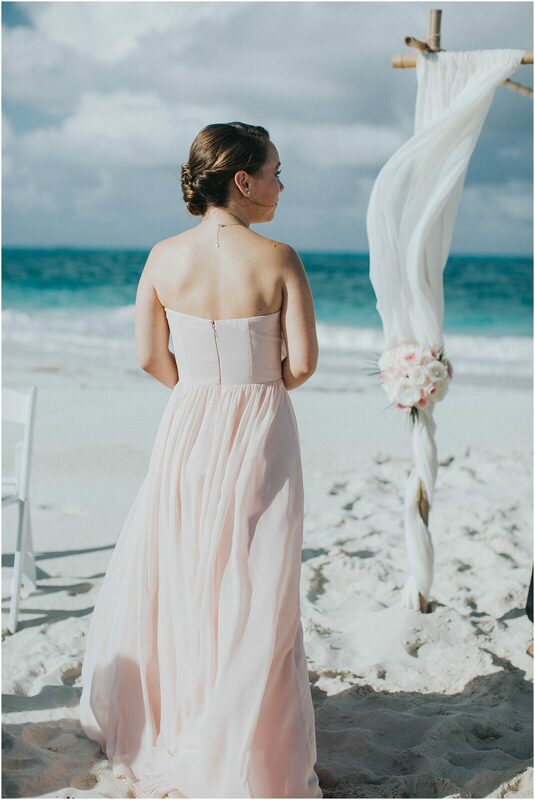 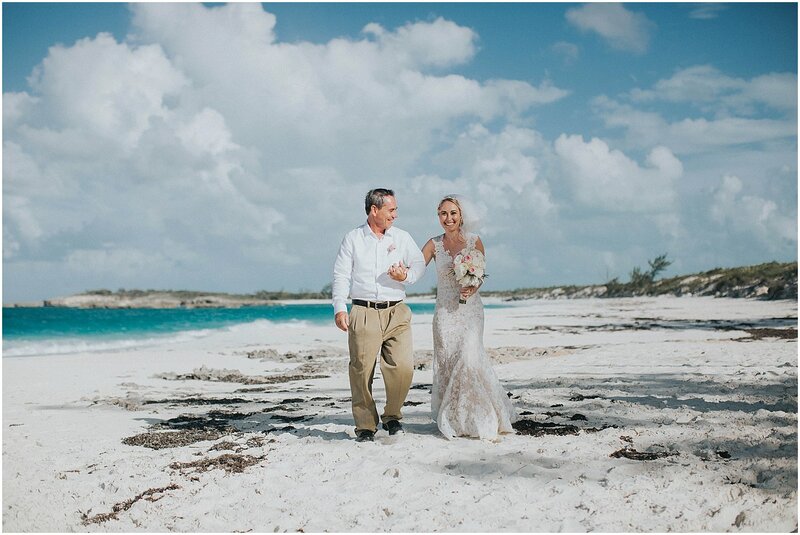 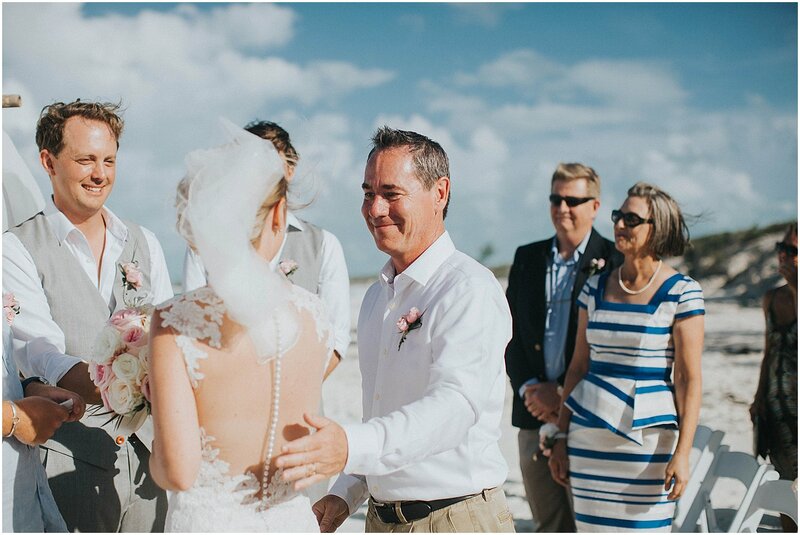 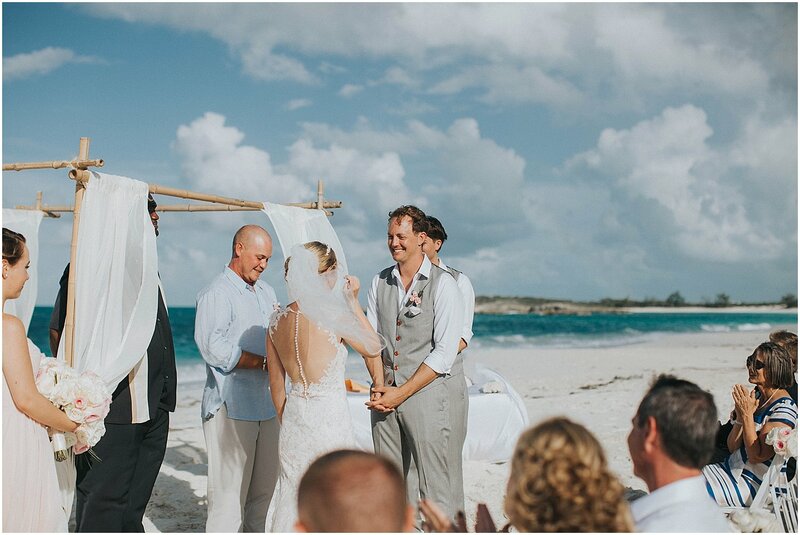 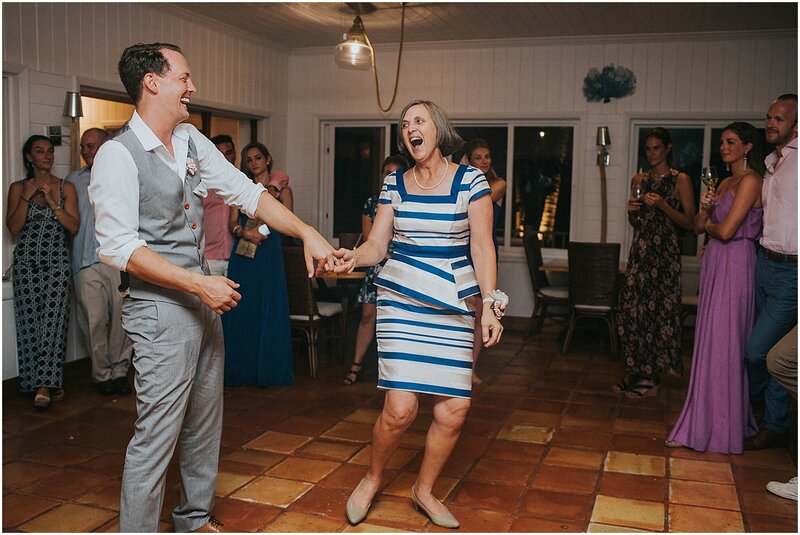 Kristin and Doug’s wedding on Little Exuma, Bahamas was nothing short of amazing. 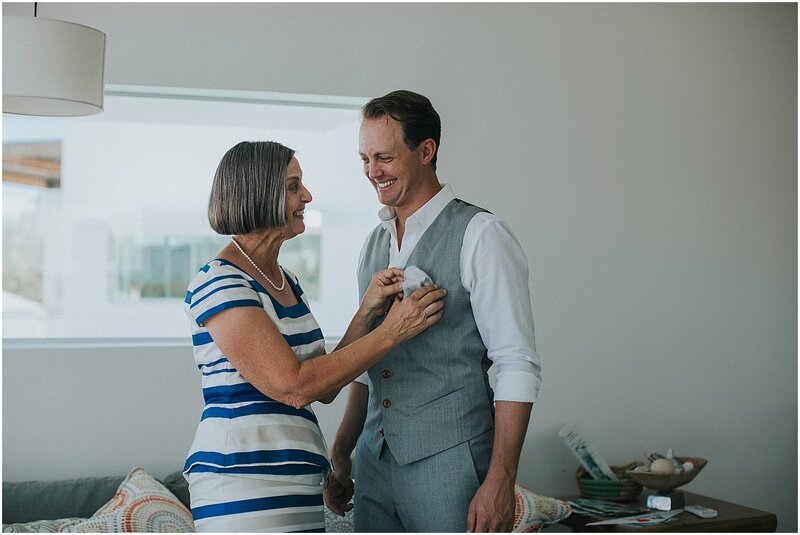 I hadn’t had the pleasure of meeting with Kristin and Doug prior to their wedding. 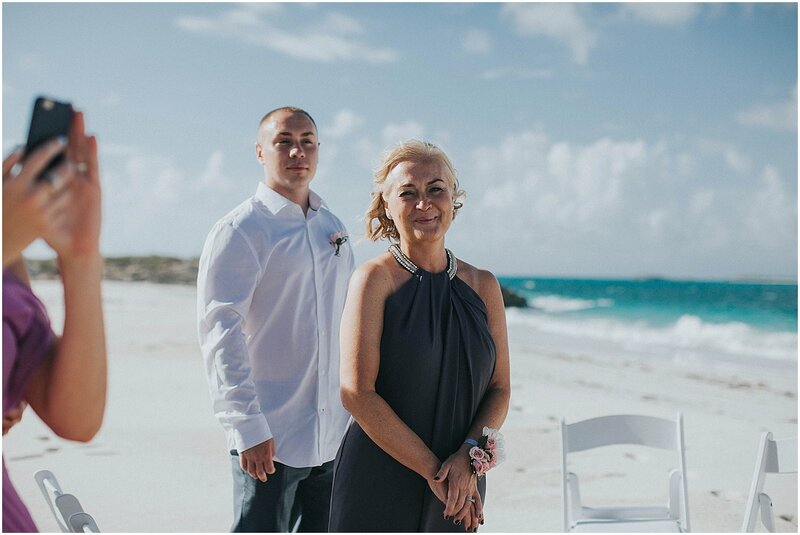 My favorite wedding planner in the Bahamas – Marva, with Chic Bahamas Weddings – had booked this couple for me. 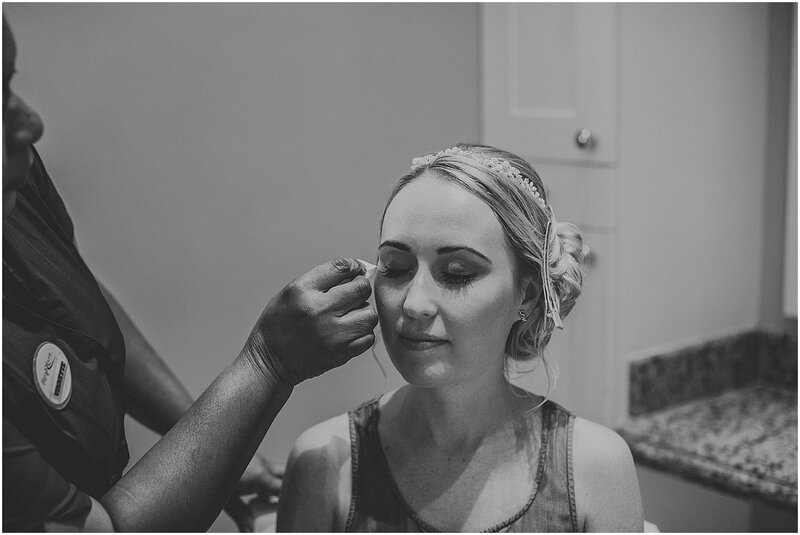 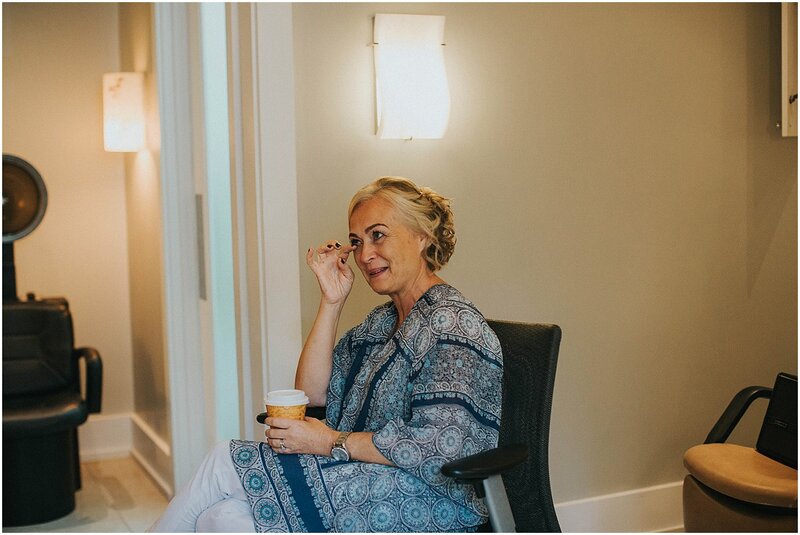 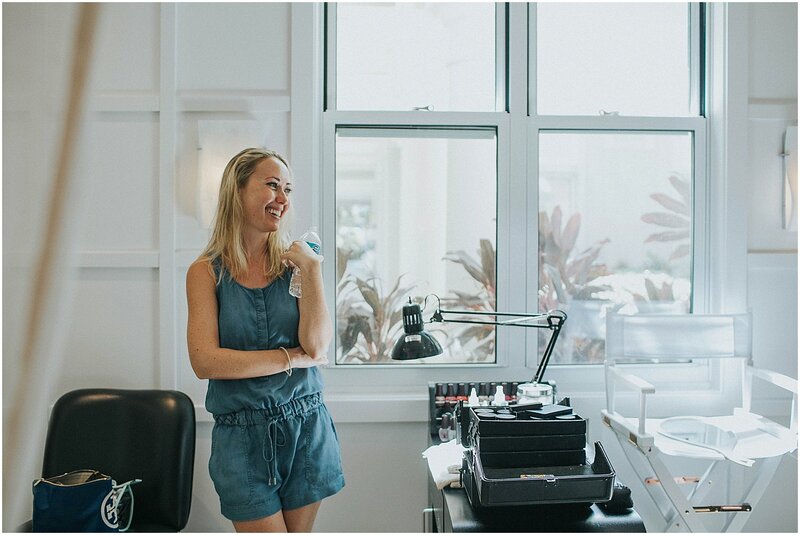 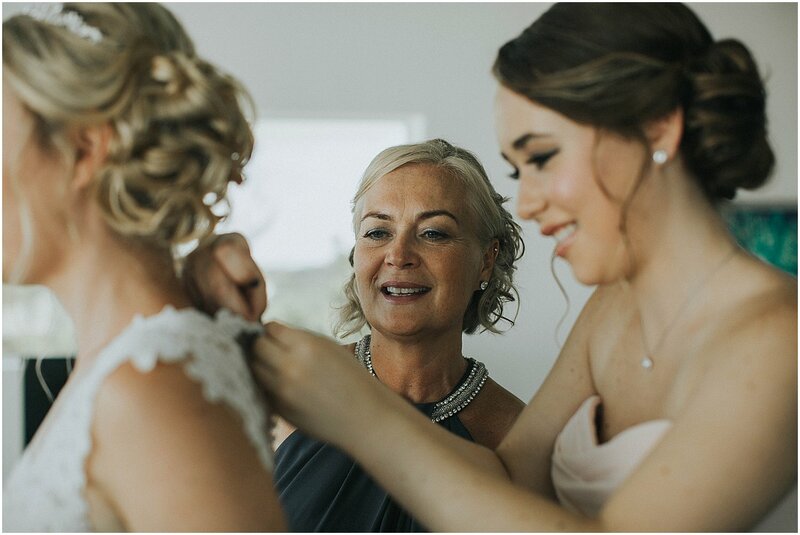 Marva always pairs me with the perfect clients. 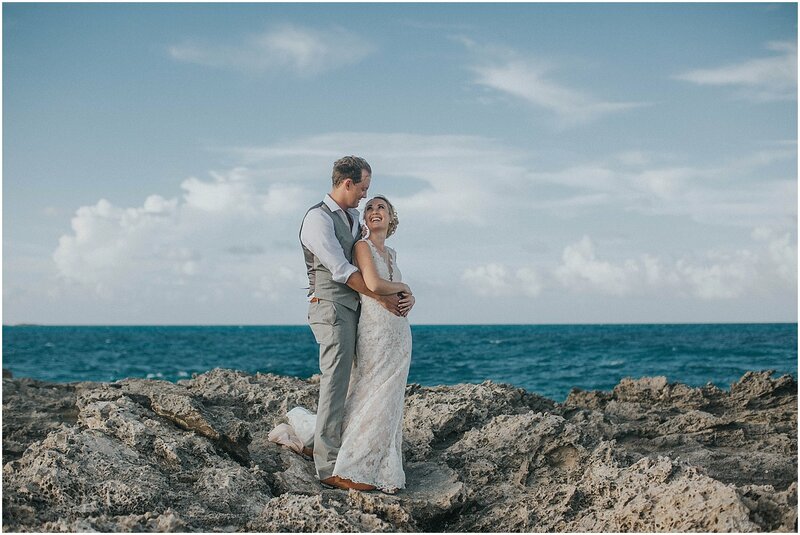 I met with them the day before their wedding and knew right away this wedding was going to be a breeze. 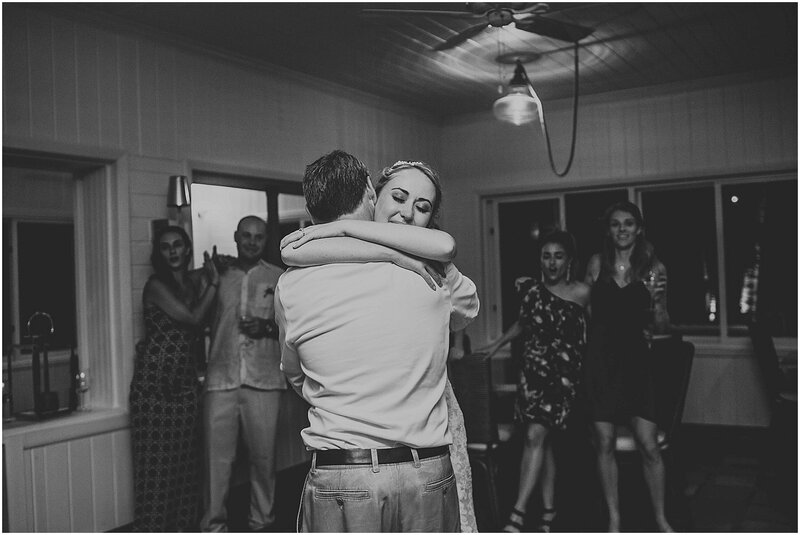 Both Kristin and Doug welcomed me with open arms as well as their families. 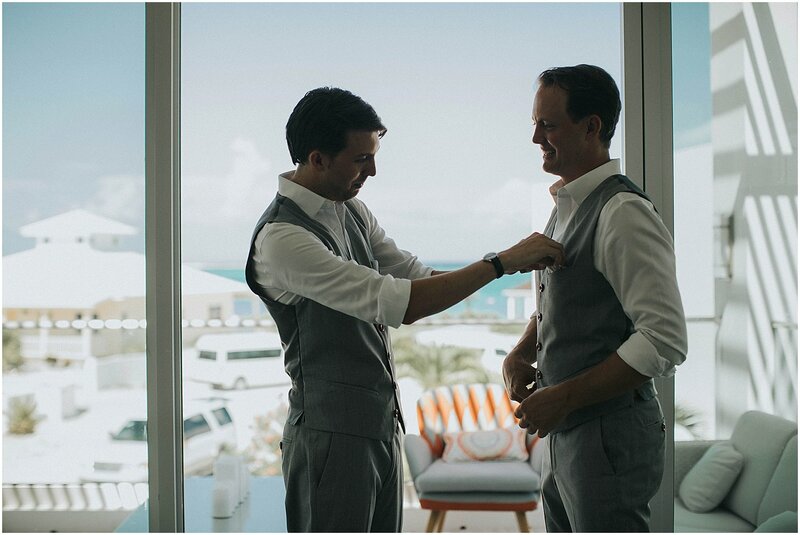 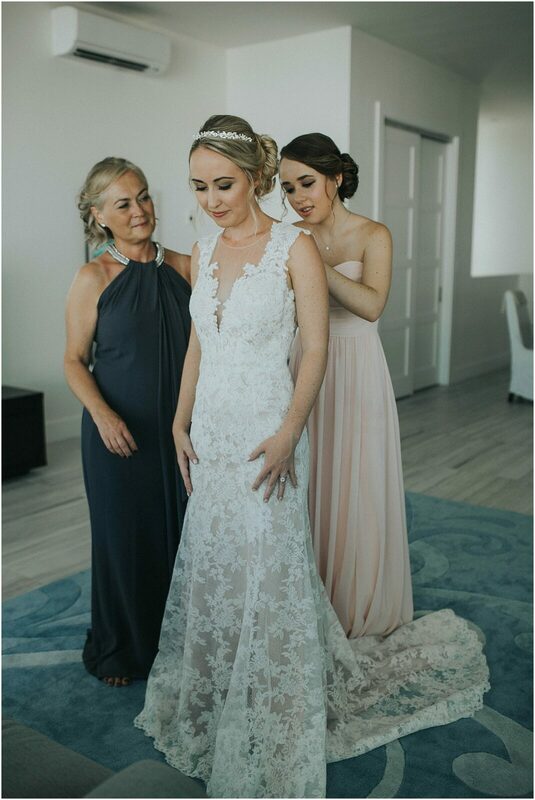 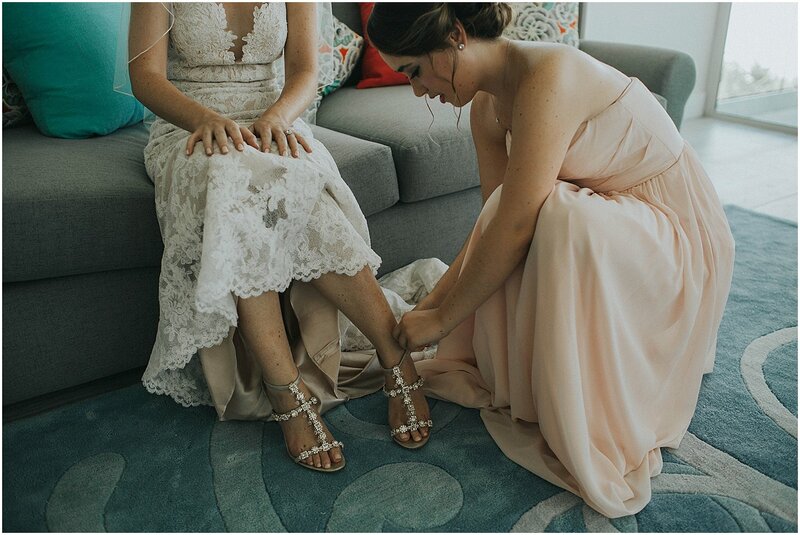 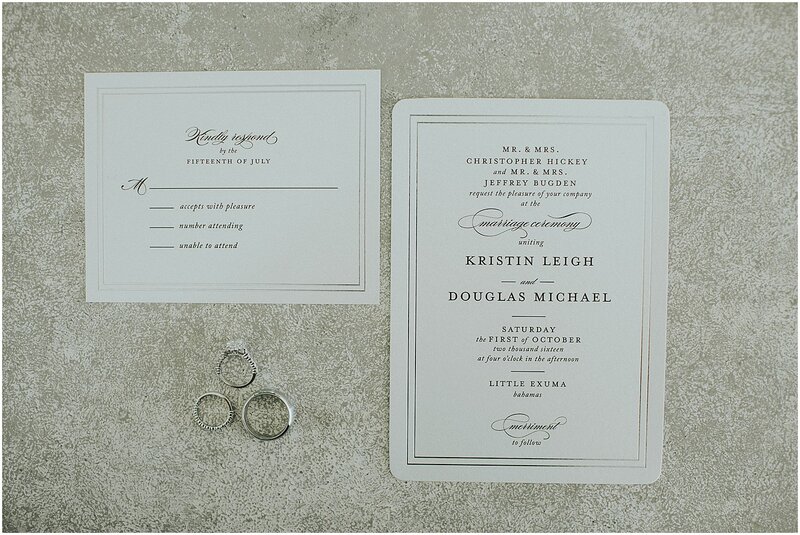 They were both so sweet, Doug, was super into the planning and making sure everything was perfect. 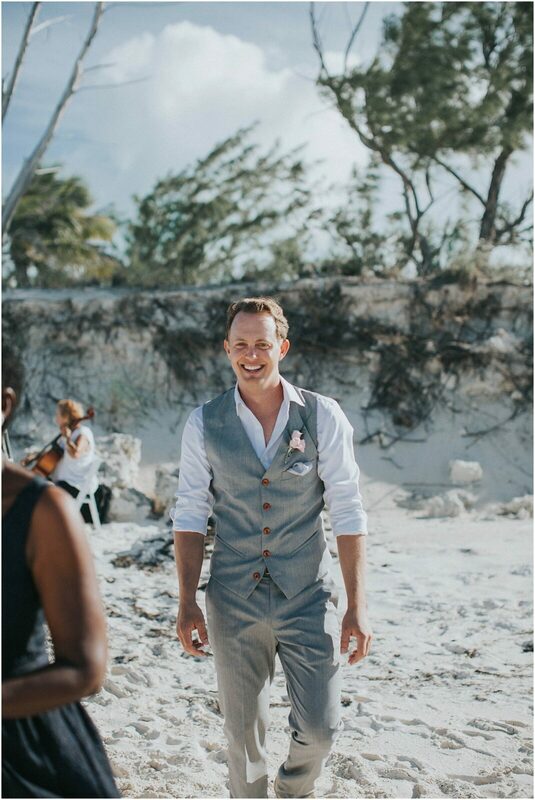 Good man Doug! 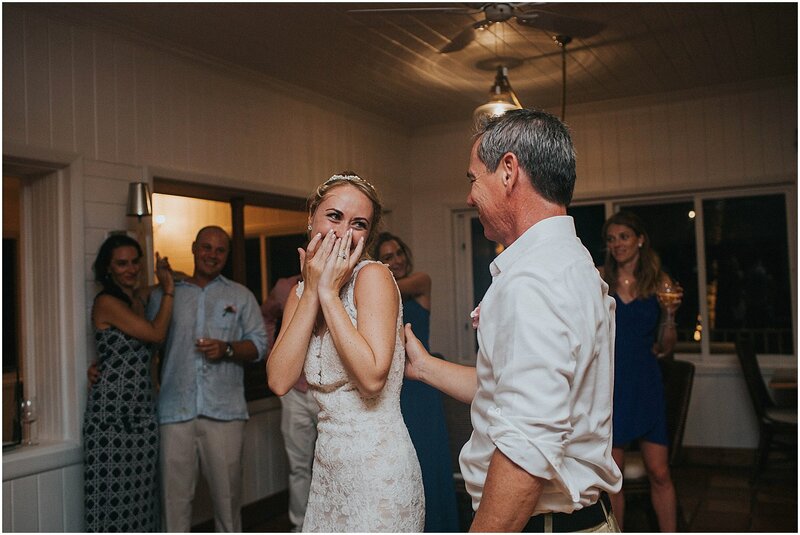 Doug’s family had traveled all the way from Australia and Kristin’s family had traveled from New York. 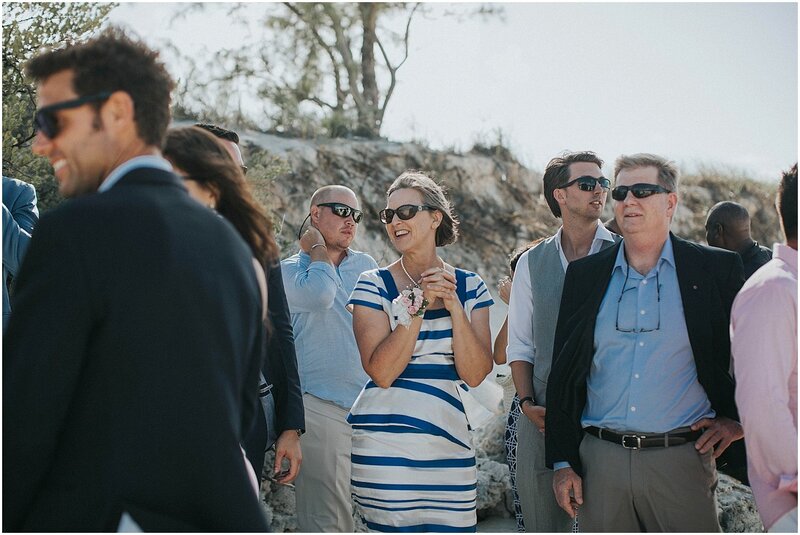 They had guests from all over including Hong Kong! 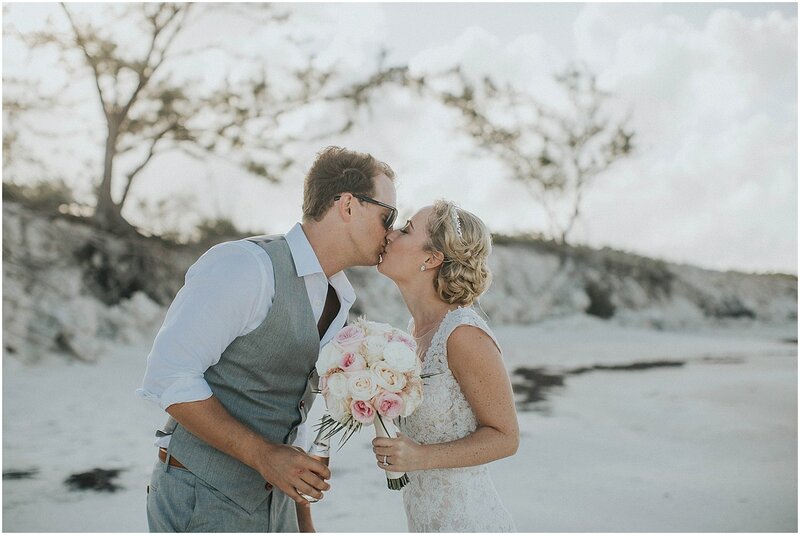 Dough and Kristin met in Australia while she was studying abroad. 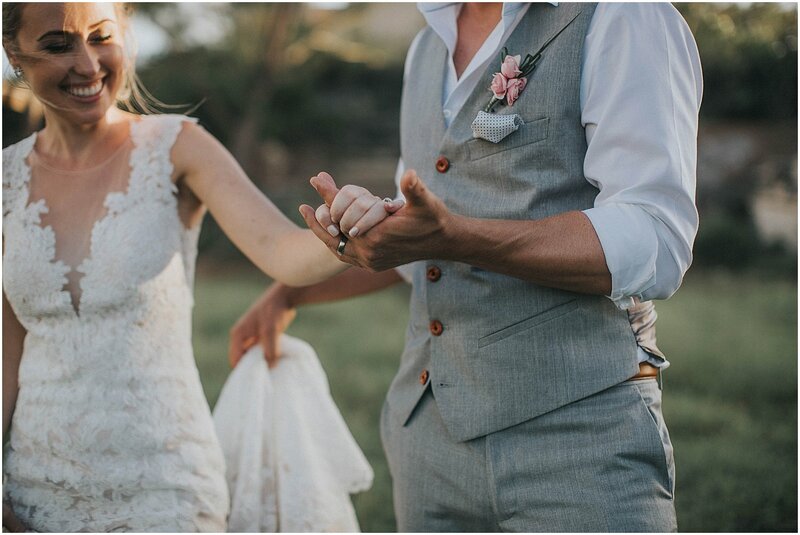 The two clicked immediately and began dating. 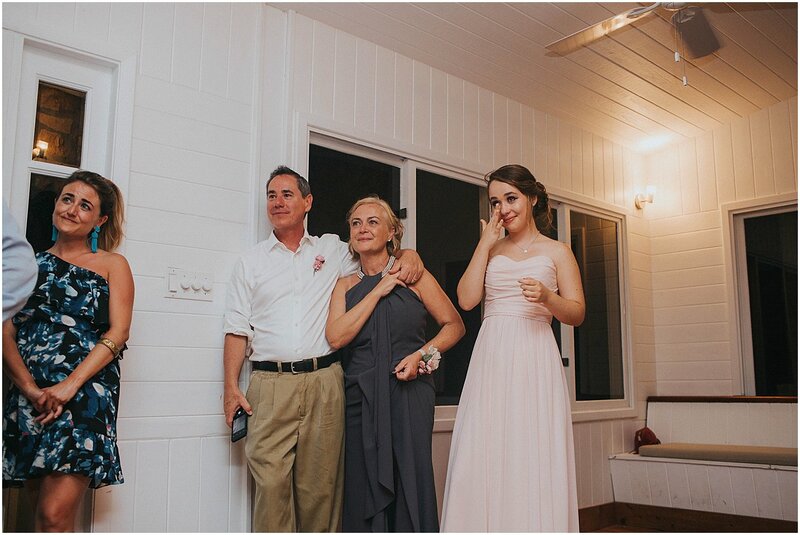 When it was Kristen’s time to head back to the states they parted ways for a bit. 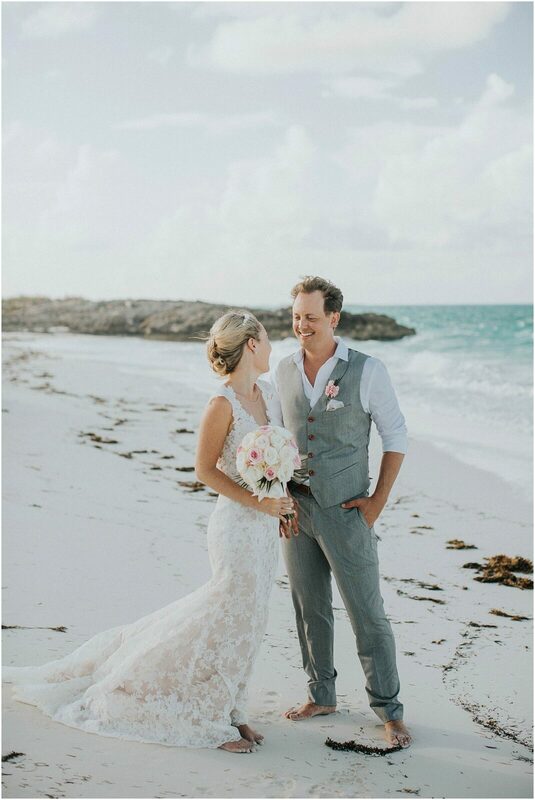 It didn’t take long for Doug to pack up and come to the US to get Kristin and the rest is history! 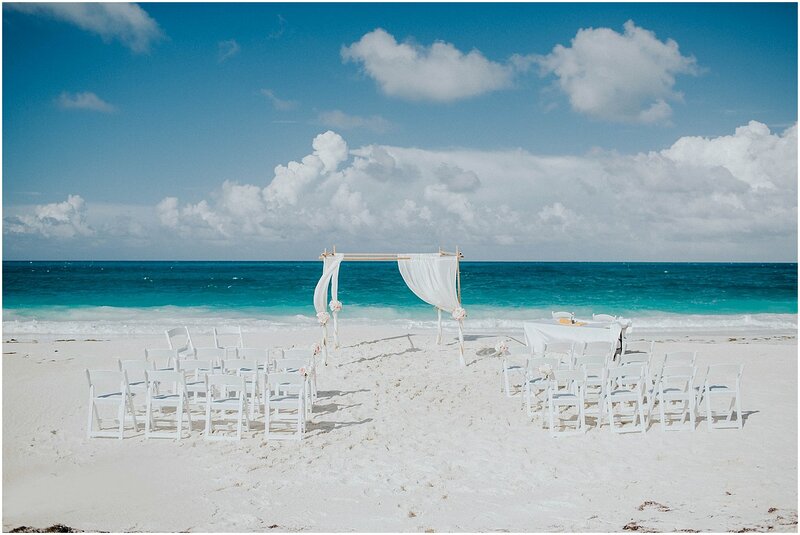 Seriously so romantic! 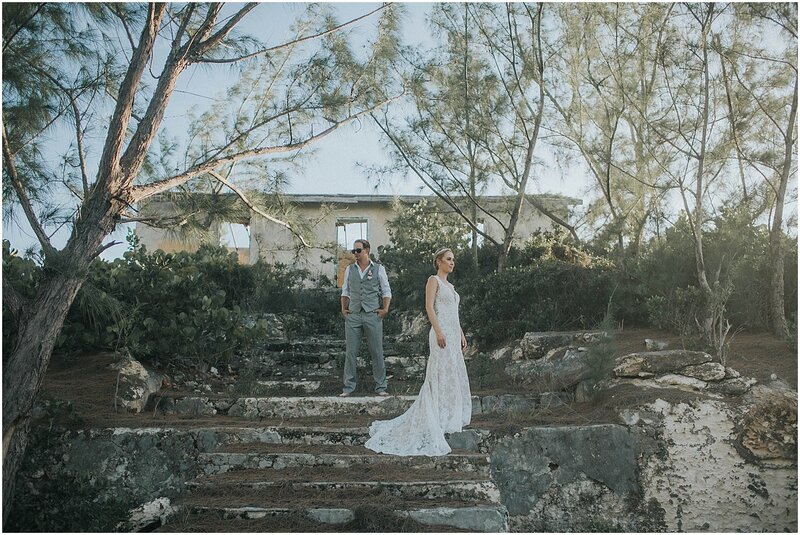 We woke up the day of the wedding with no power on the island – no power means no water t00. 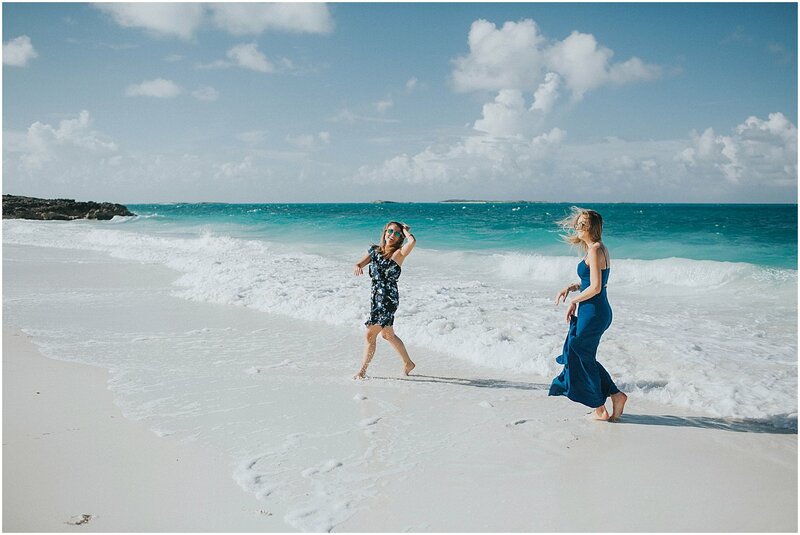 Now, I shoot a lot in the islands and know this is common place, so I wasn’t too worried. 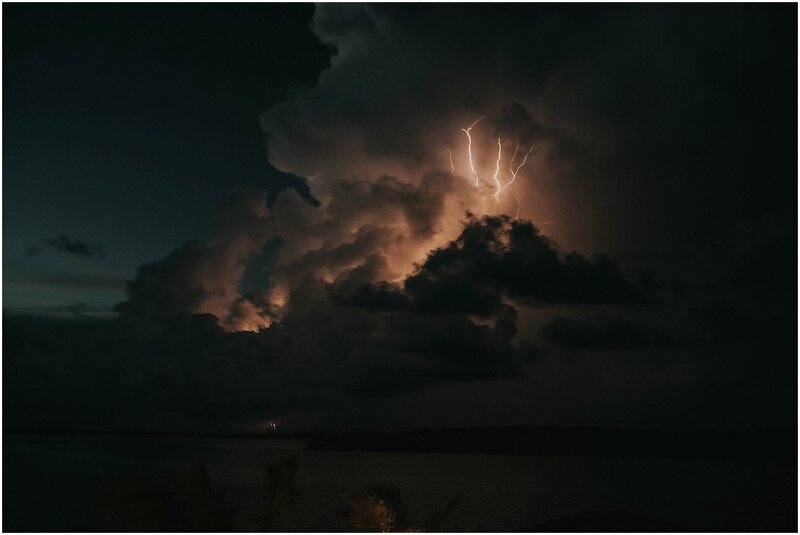 It turns out that that the power company on the island had lost power to their entire facility and was waiting on parts to fix their generators. 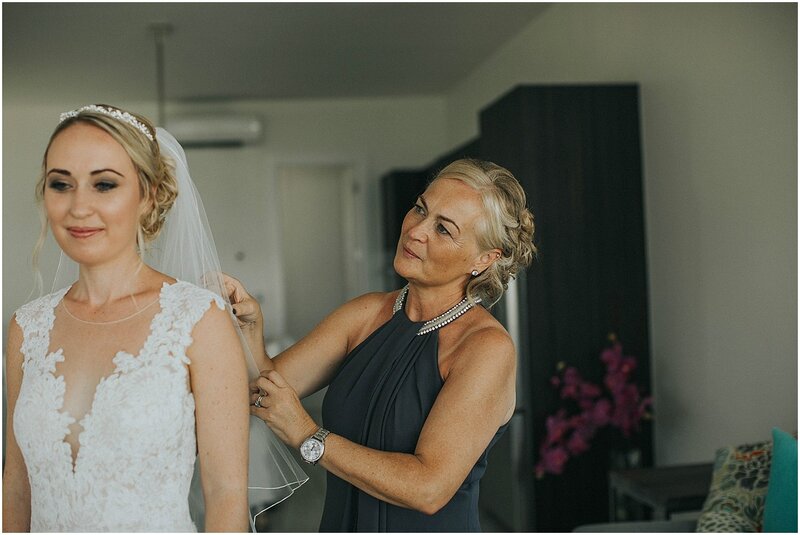 I arrived at the Sandals resort, where the girls were getting ready. 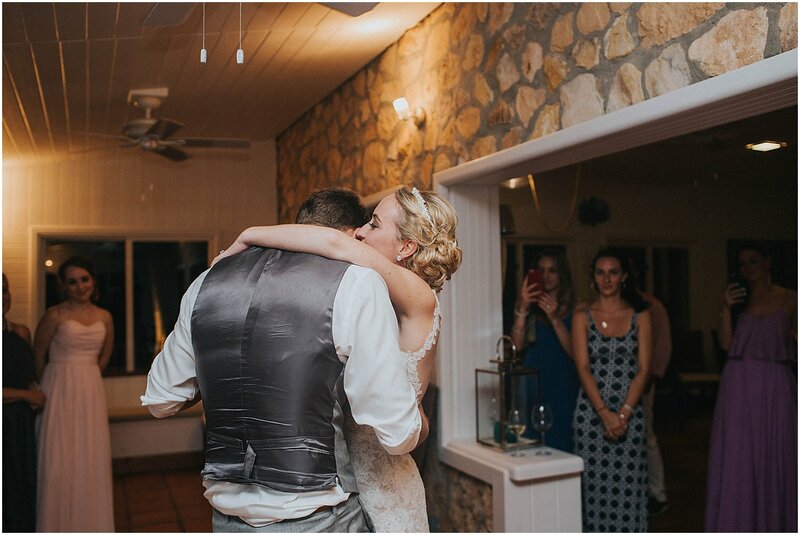 Luckily they had a generator and power! 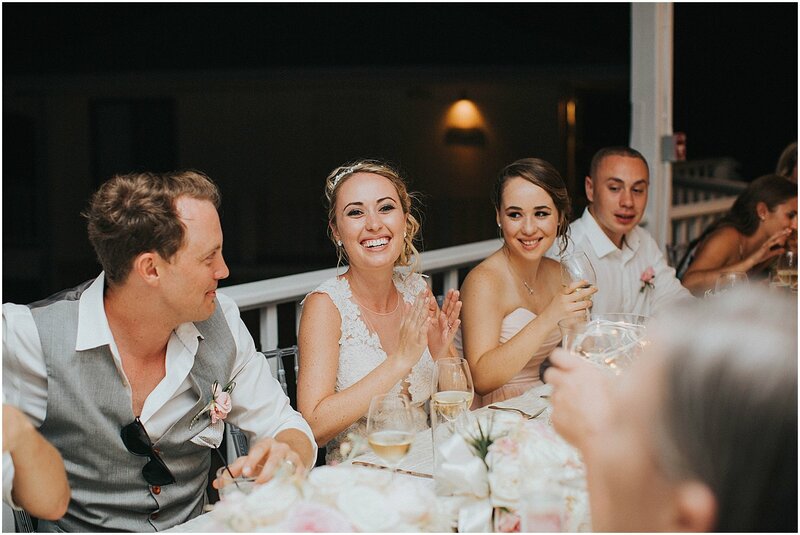 Kristin was so calm, not even worried about the power situation. 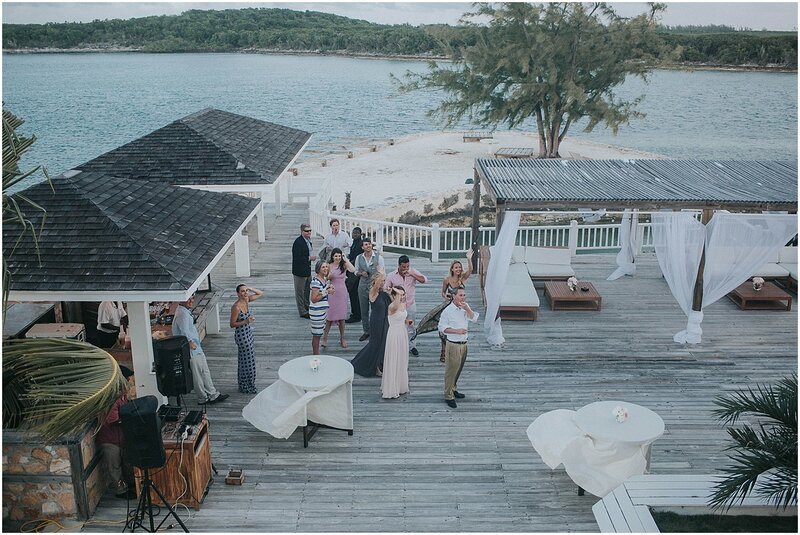 Meanwhile, Marva was busy making sure they had generators at the venue as well as setting up the female guests at Sandals so they could get ready there as well. 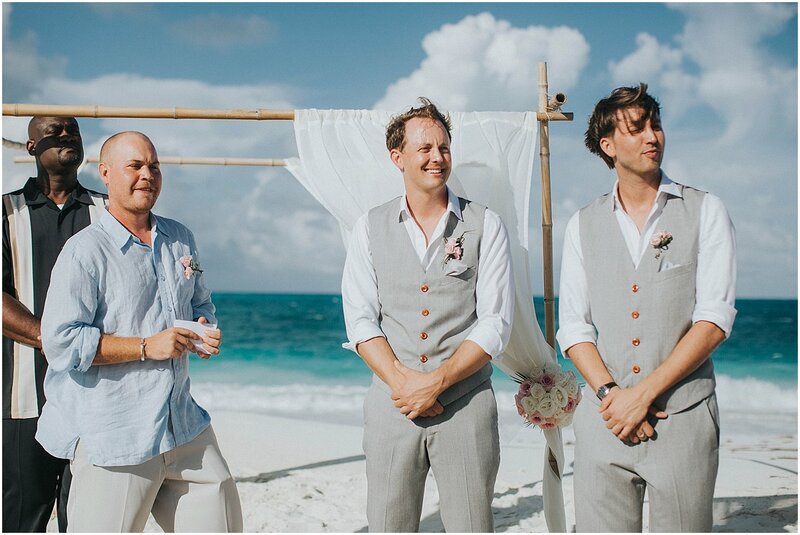 The guys could care less they were hanging at the pool and drinking beers! 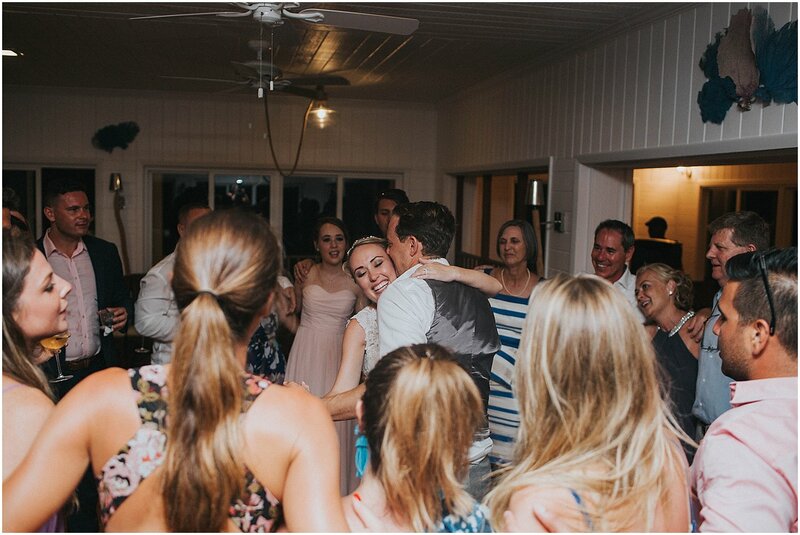 The power ended up not coming on until around 3pm just in time for the wedding! 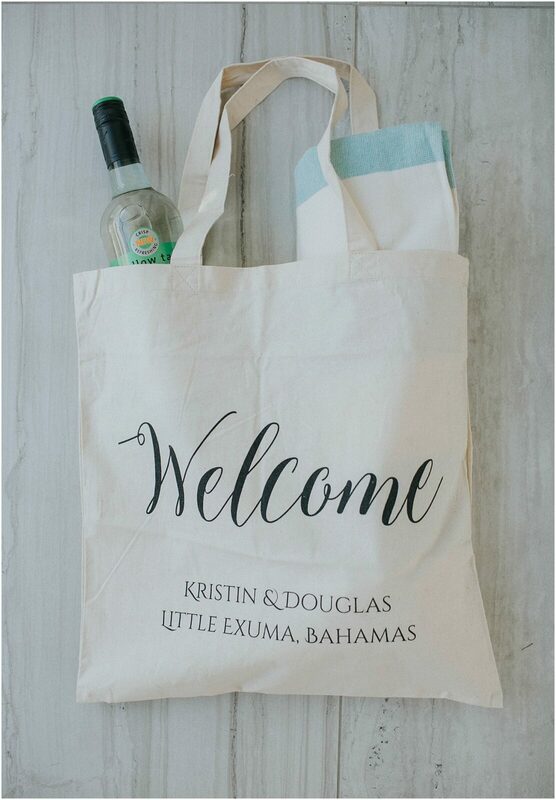 Kristin and Doug took the whole day in stride and I am so grateful for that! 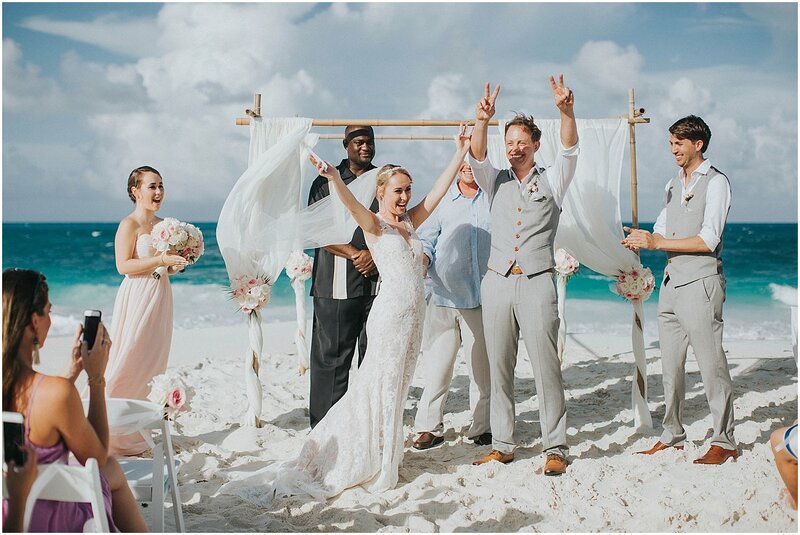 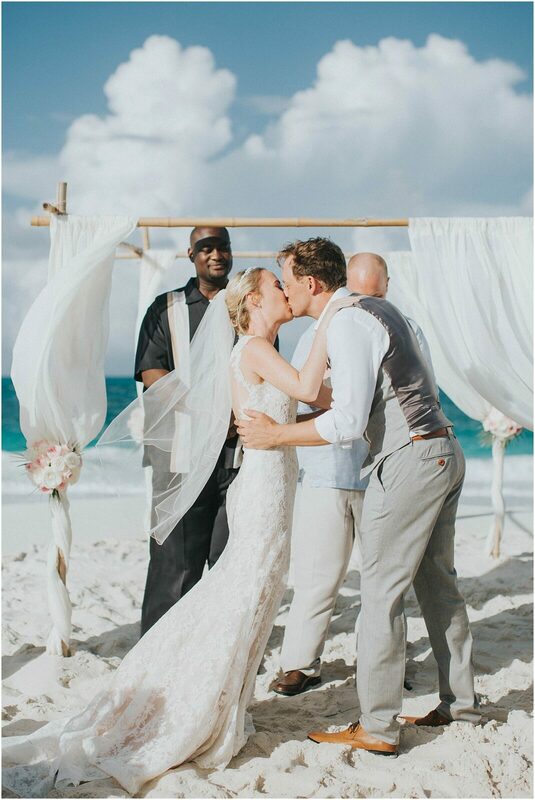 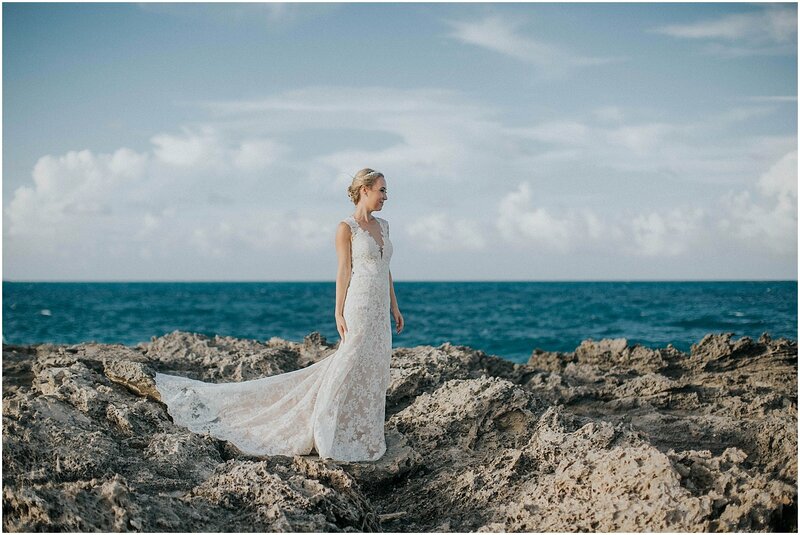 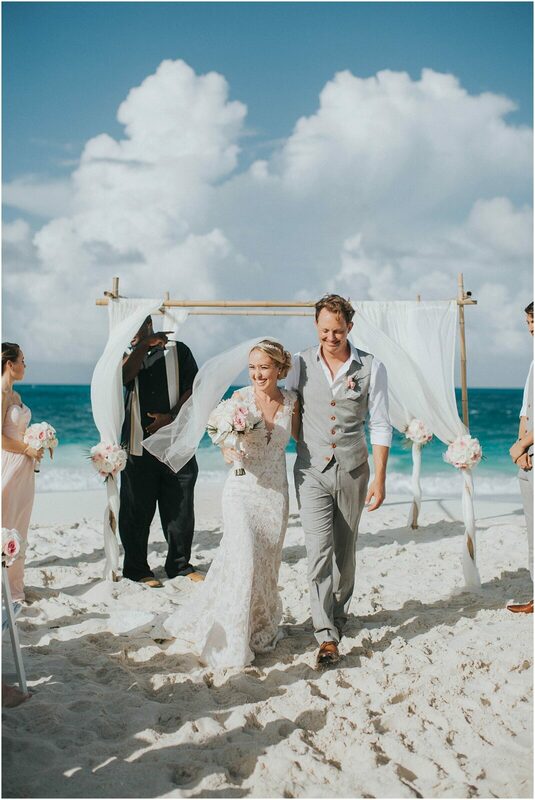 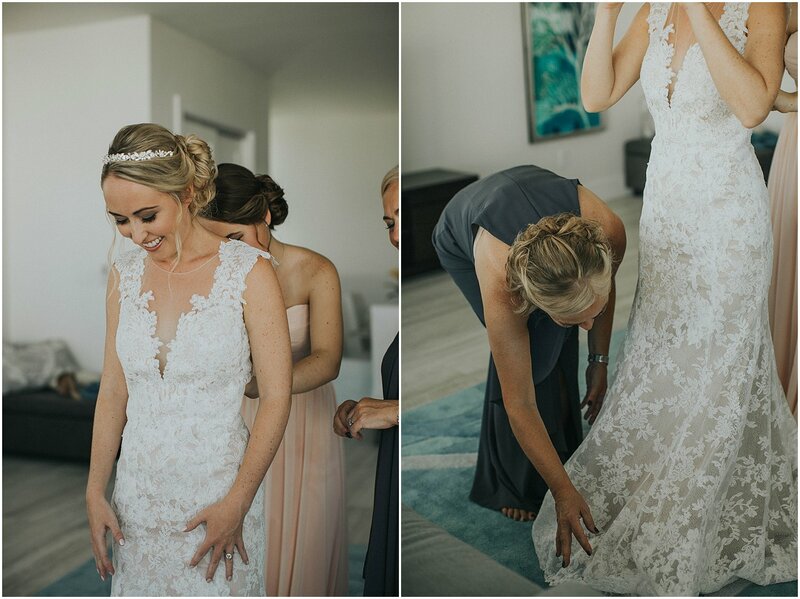 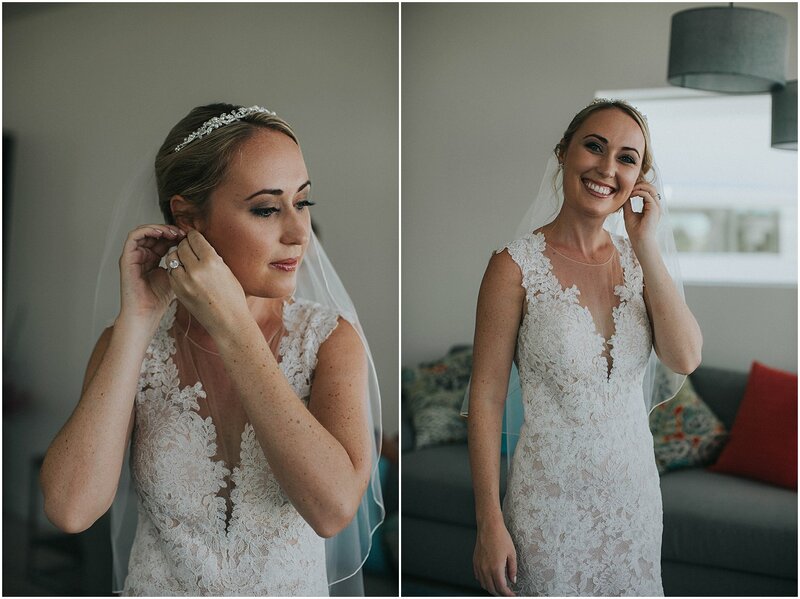 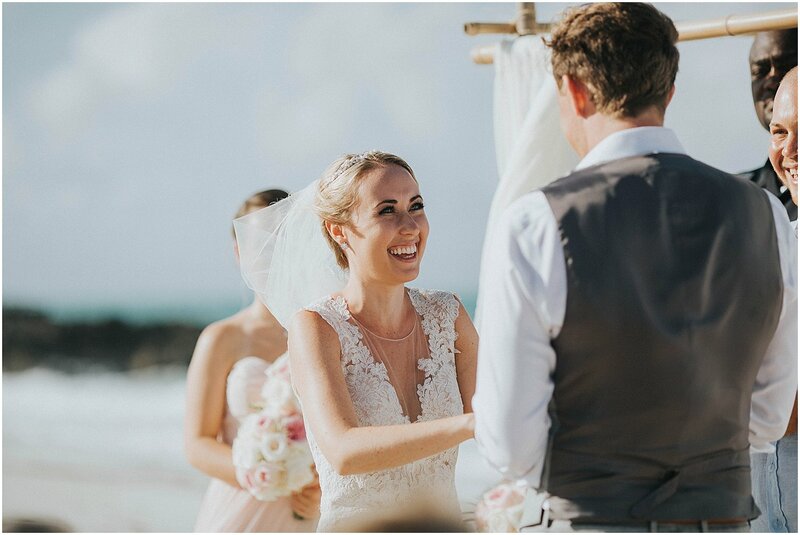 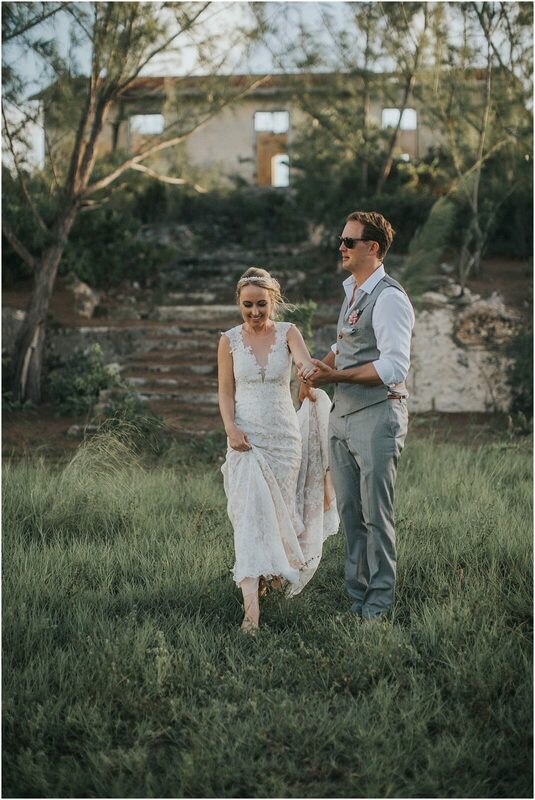 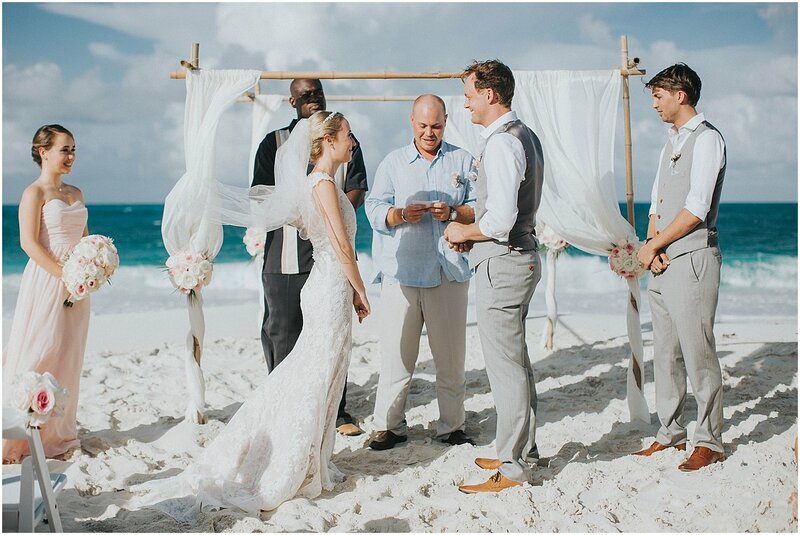 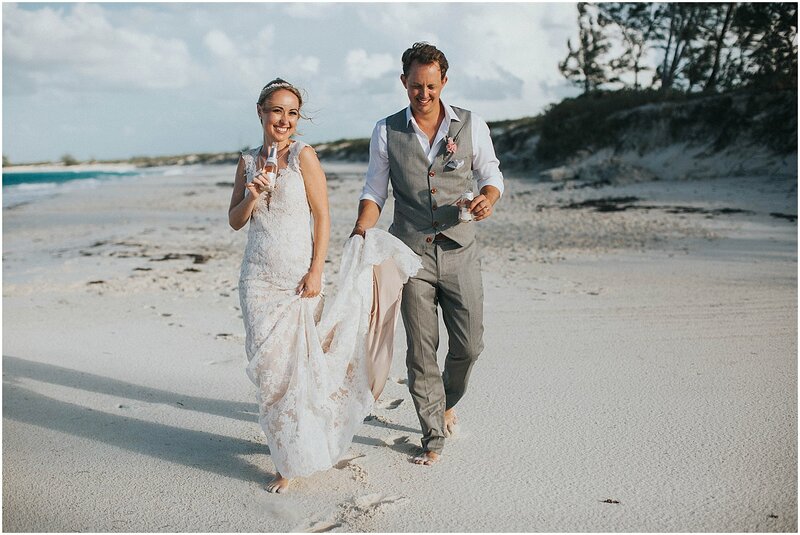 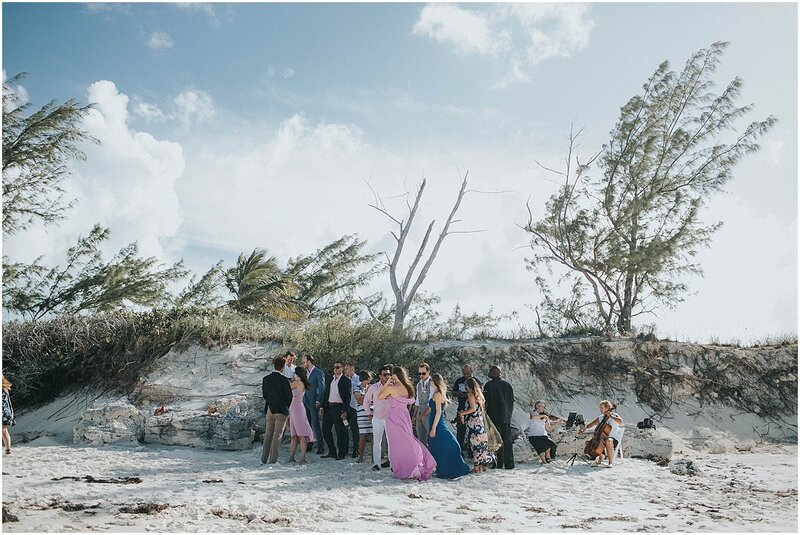 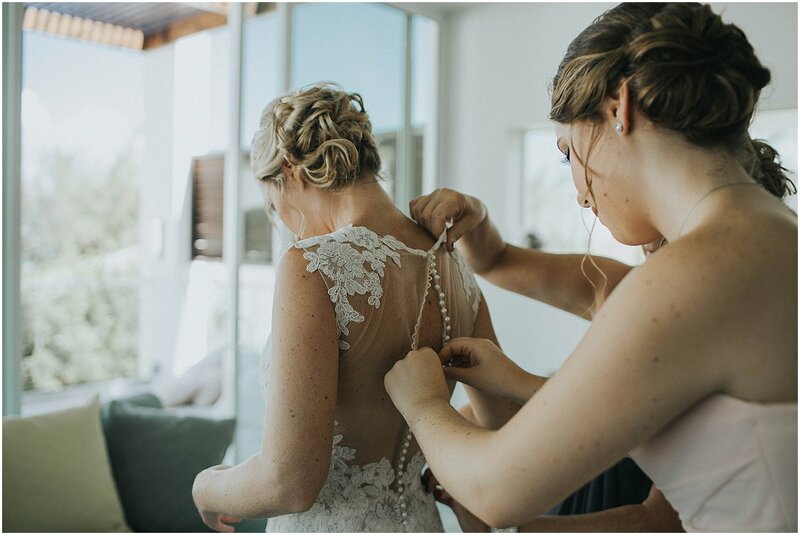 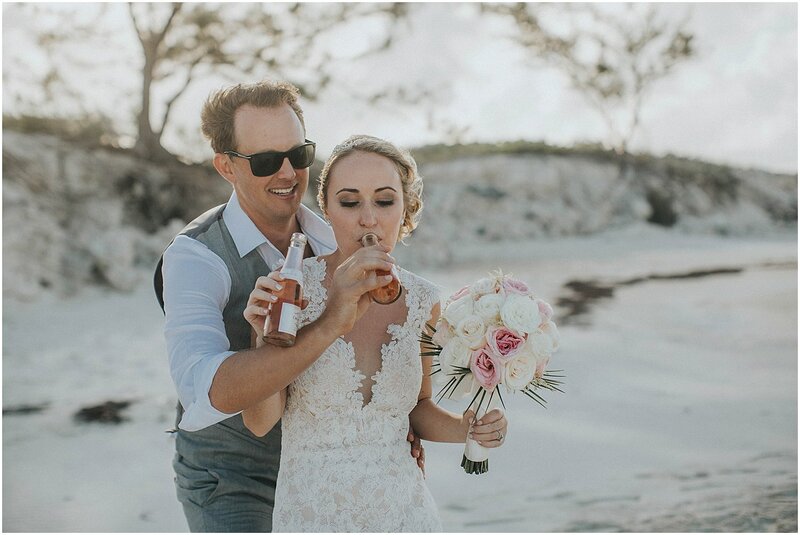 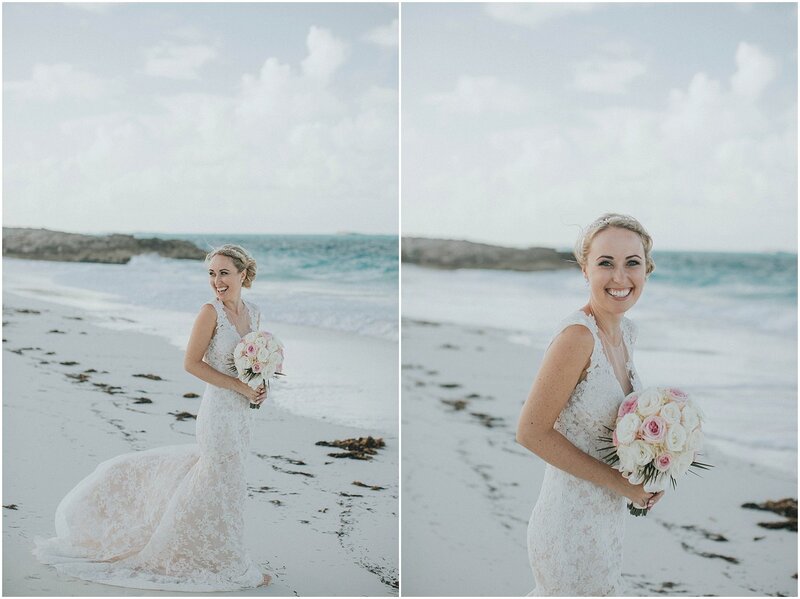 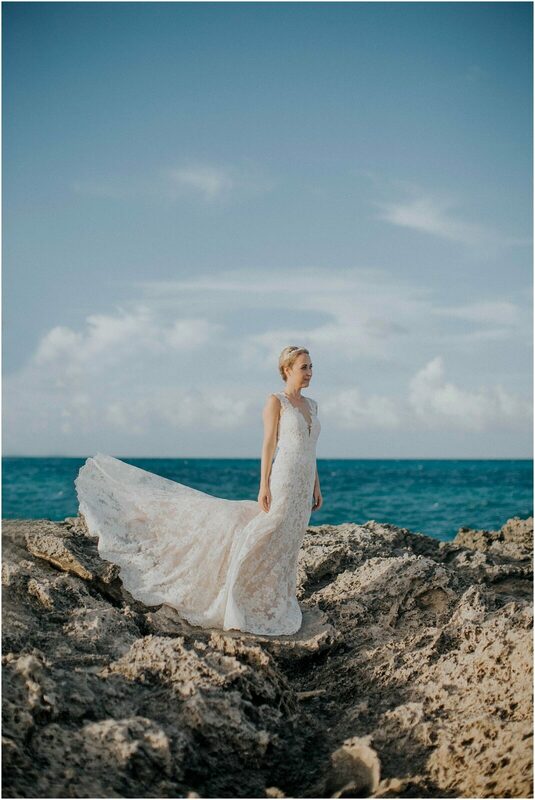 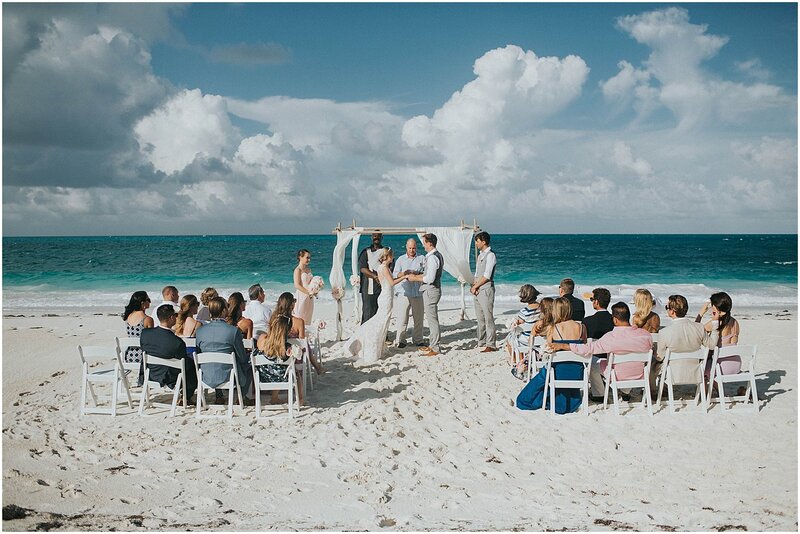 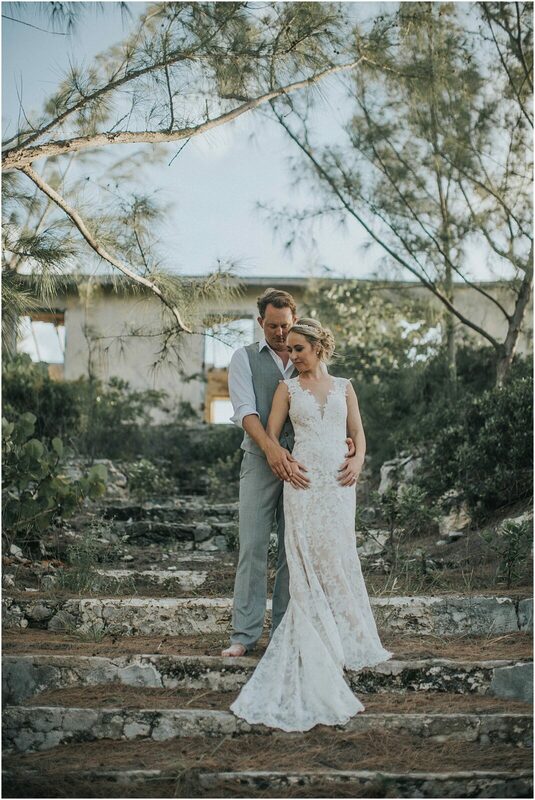 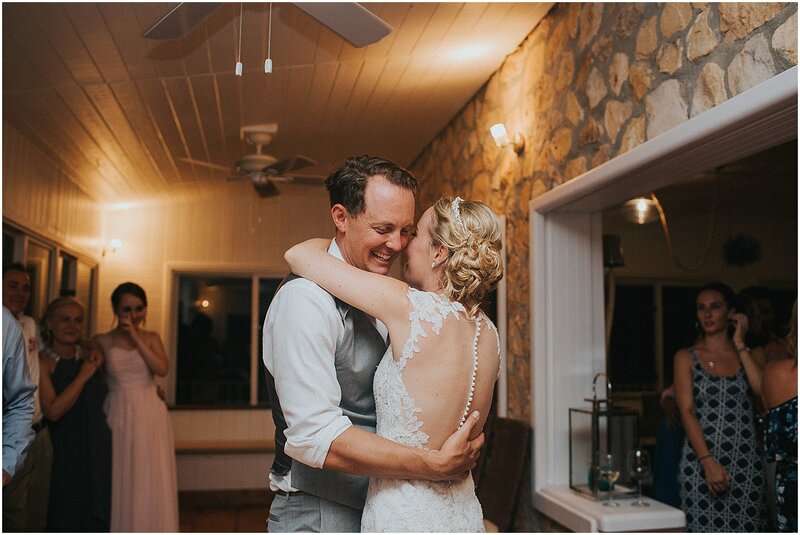 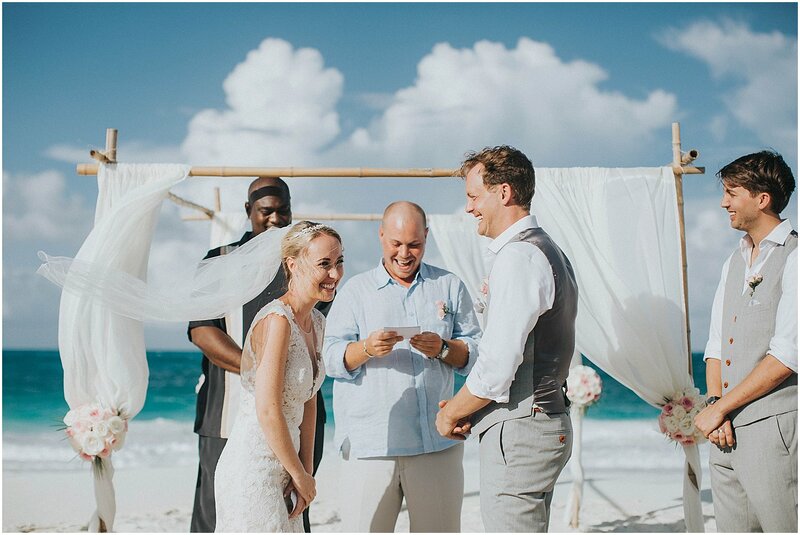 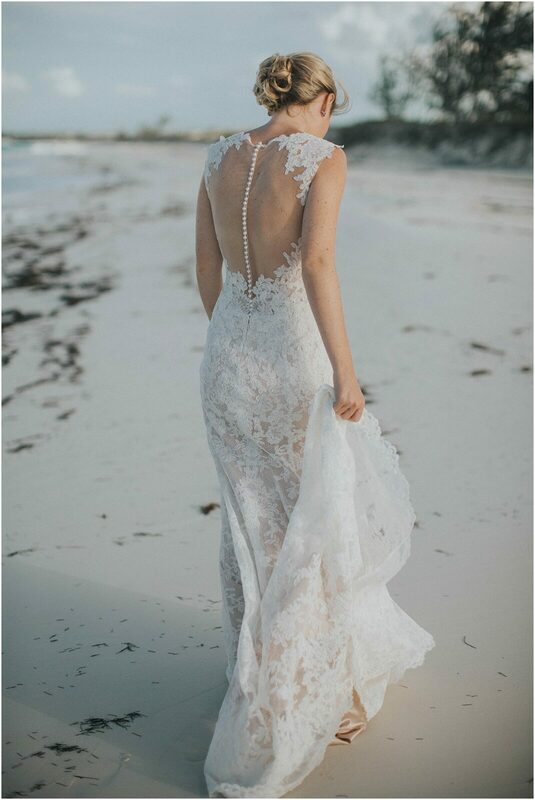 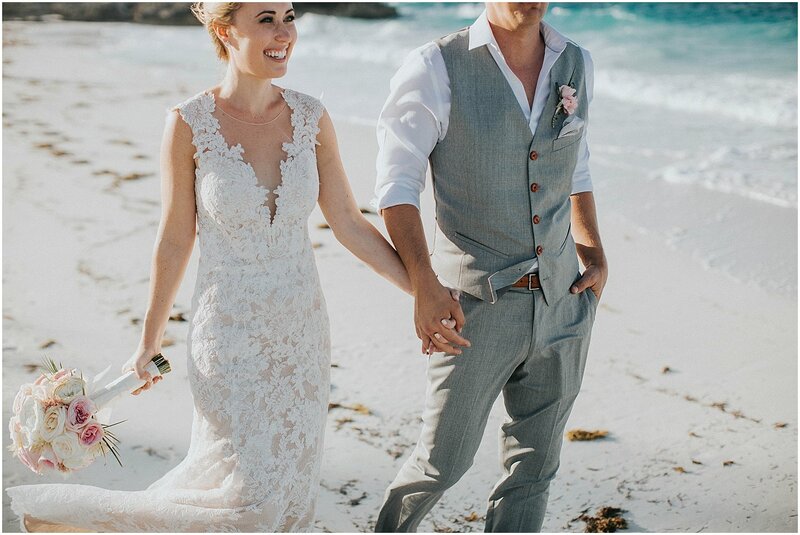 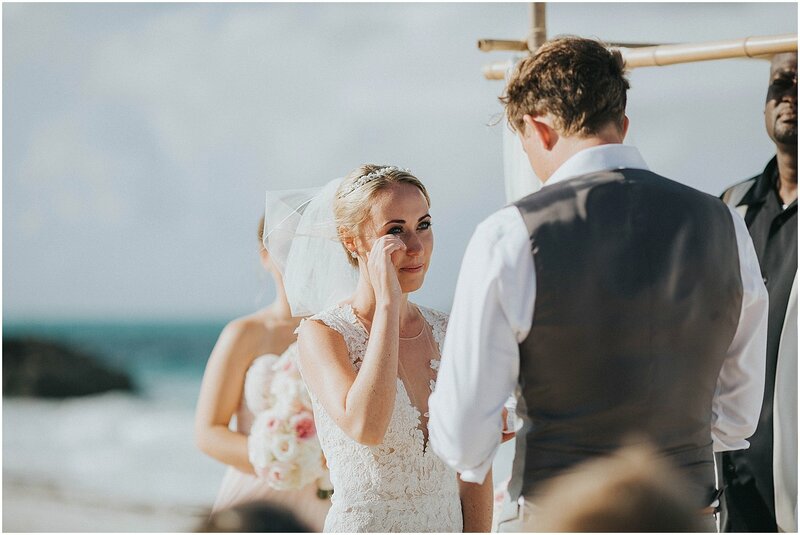 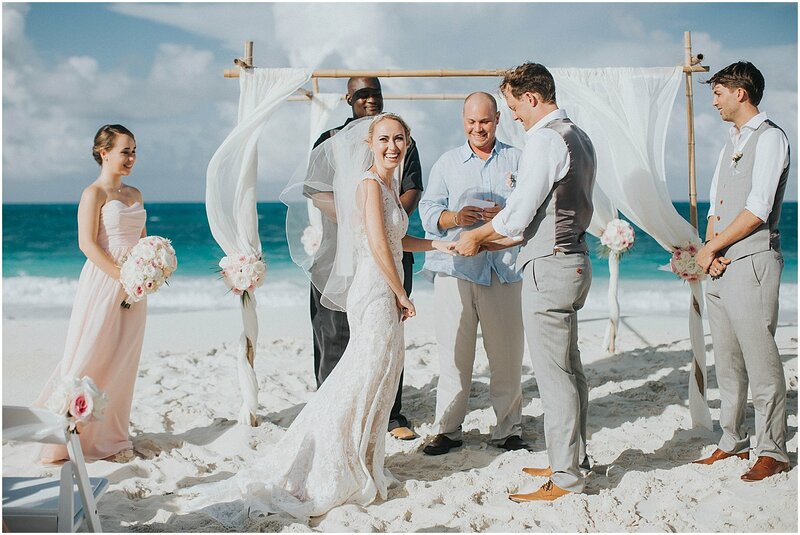 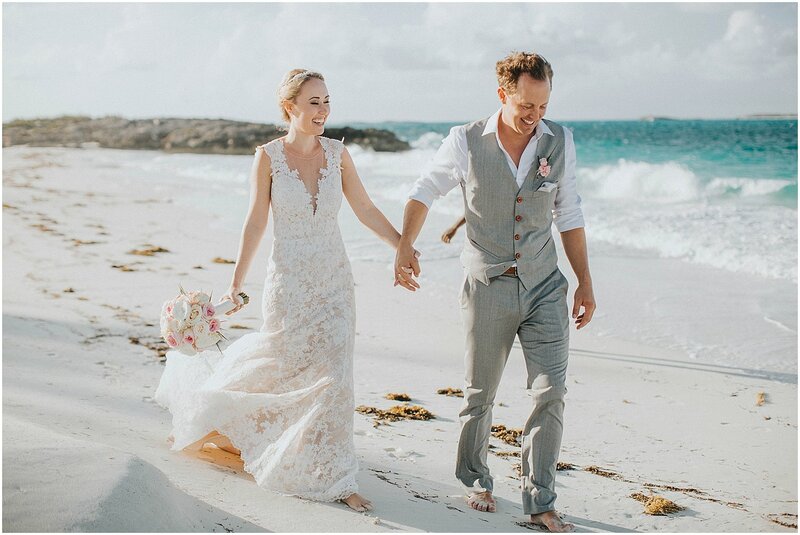 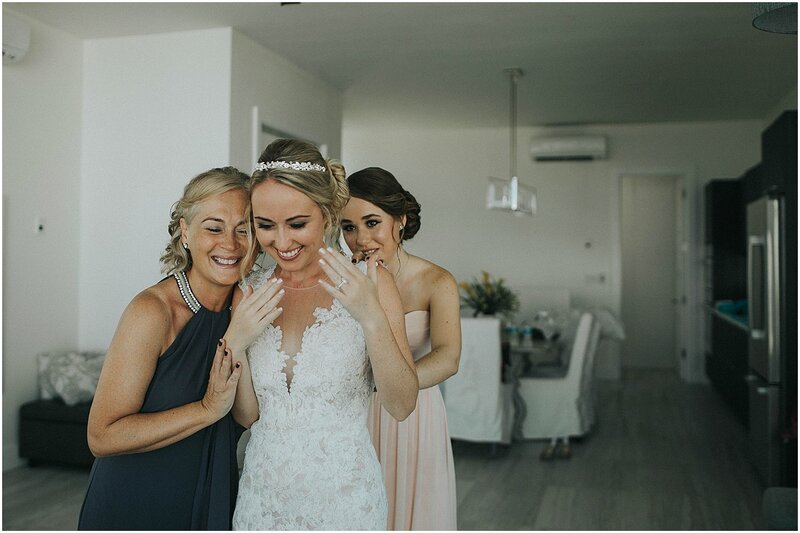 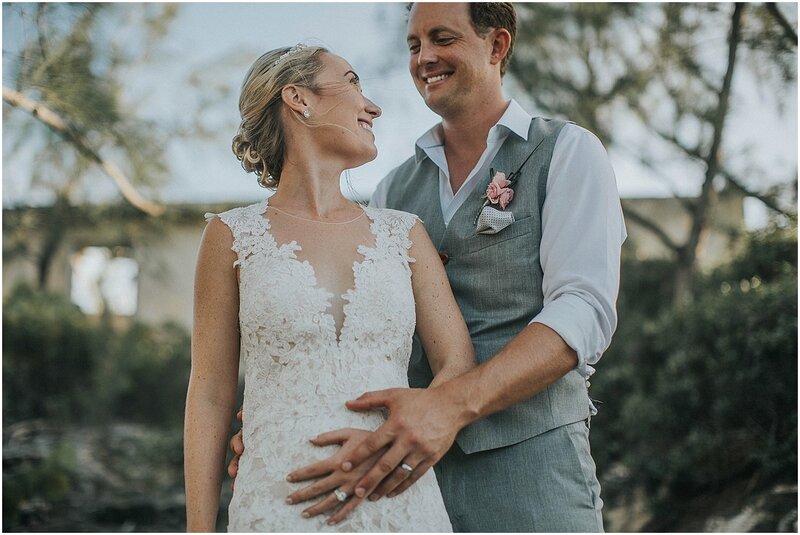 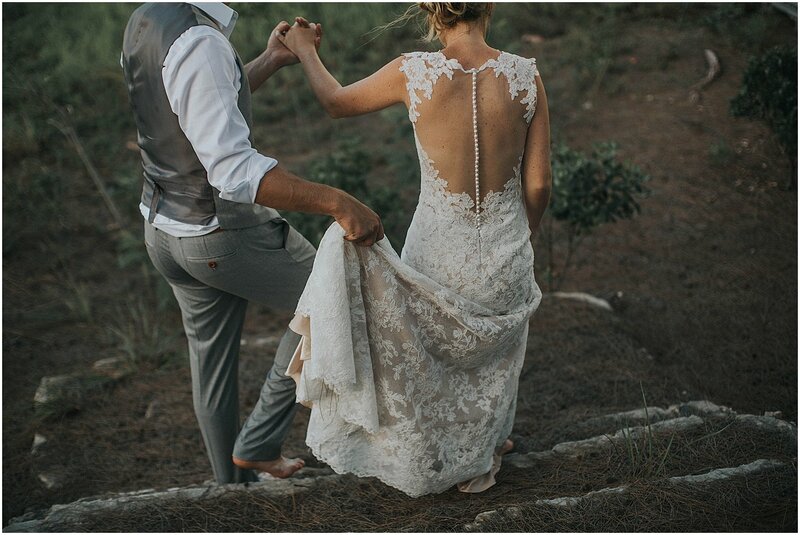 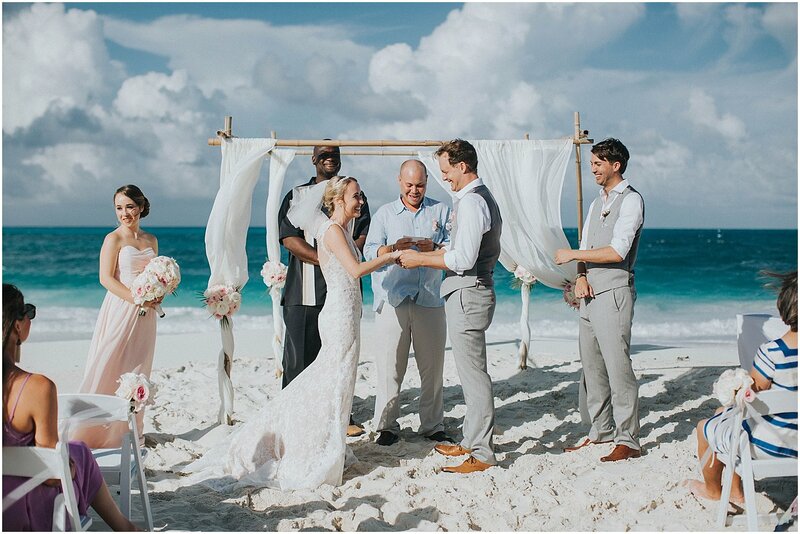 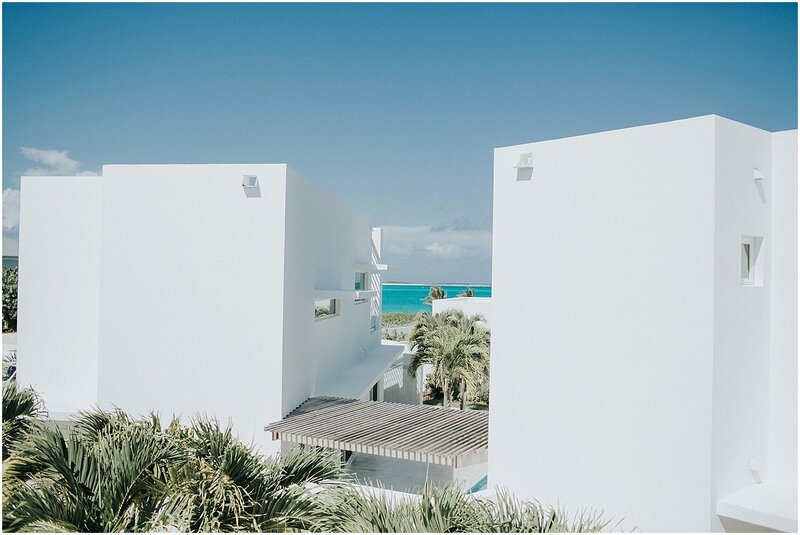 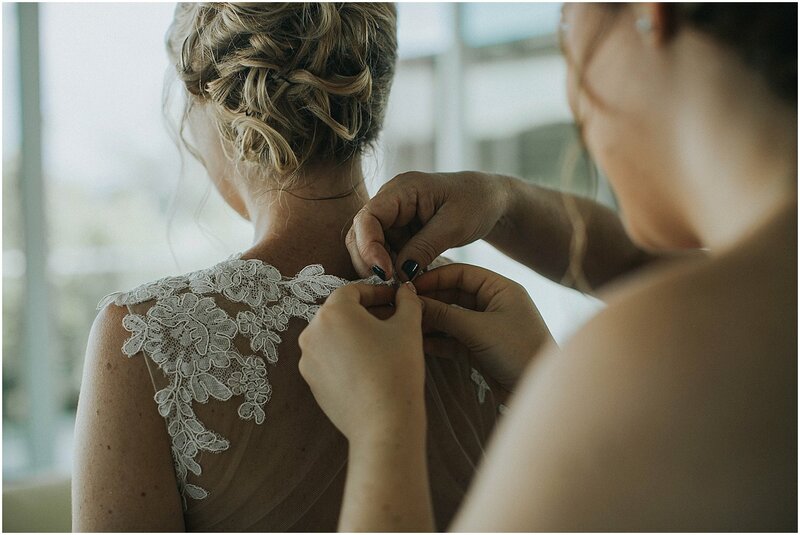 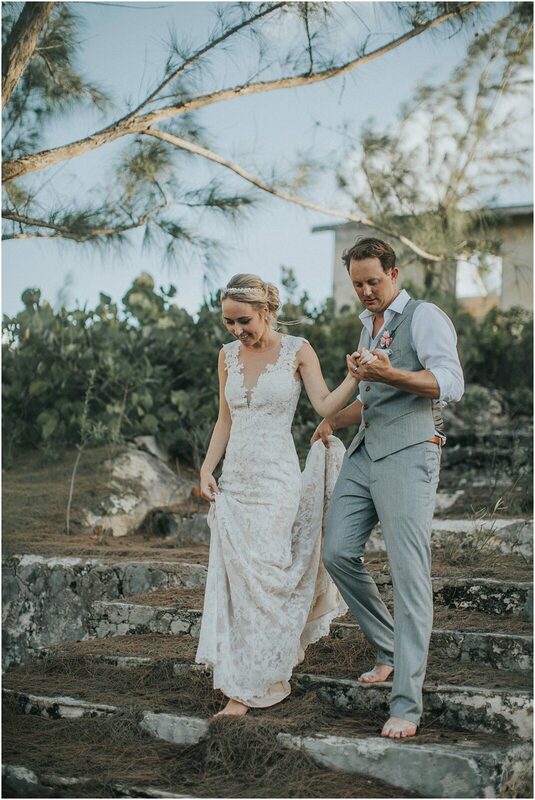 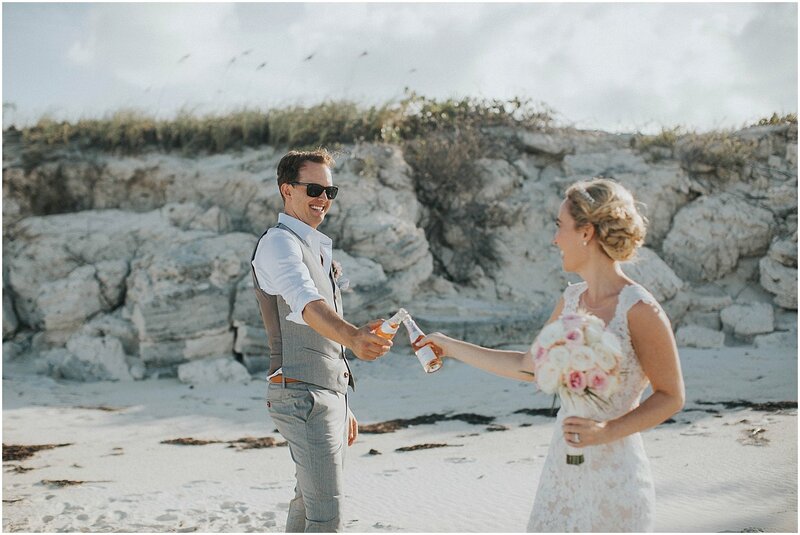 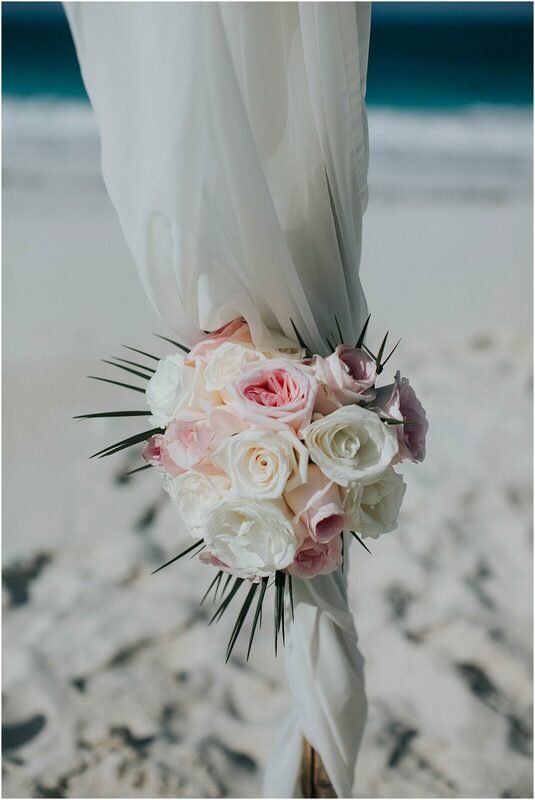 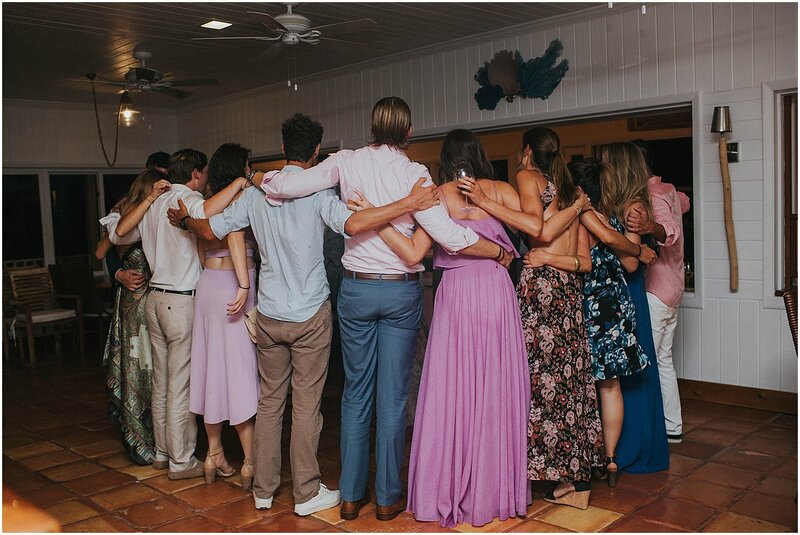 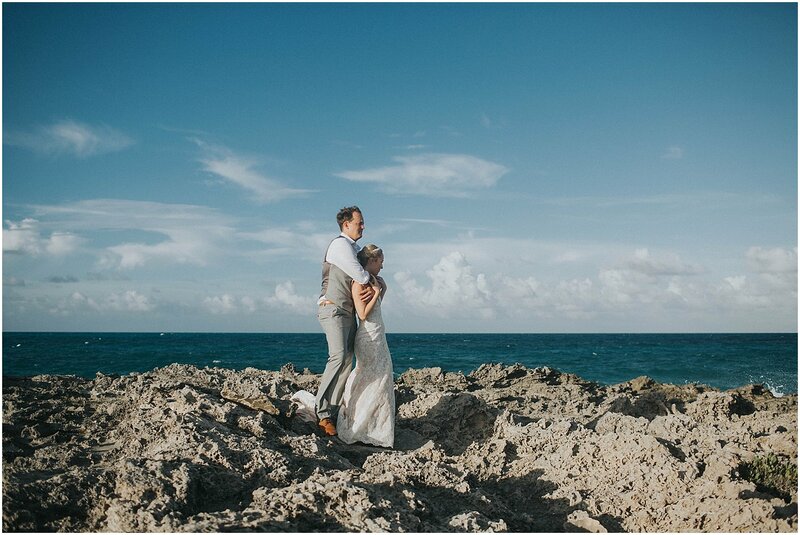 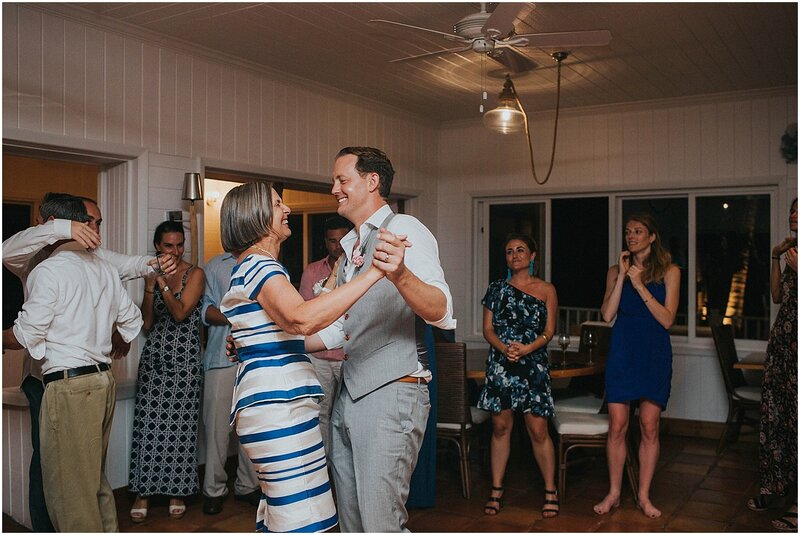 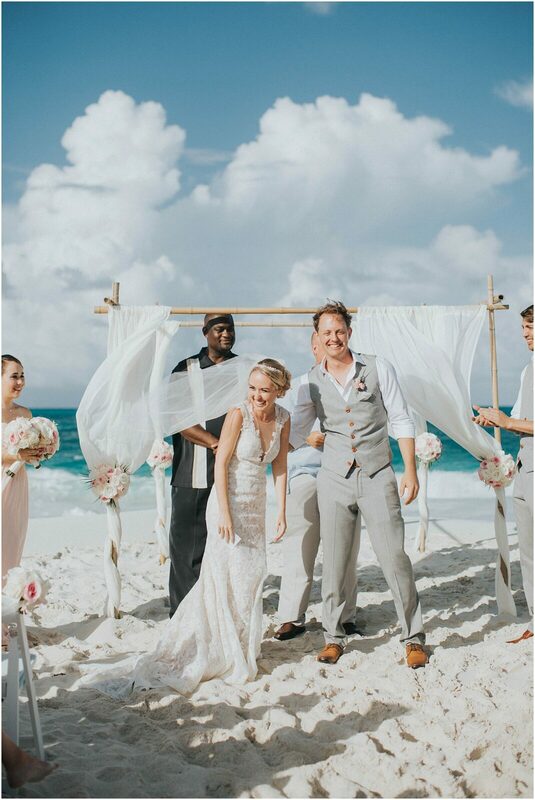 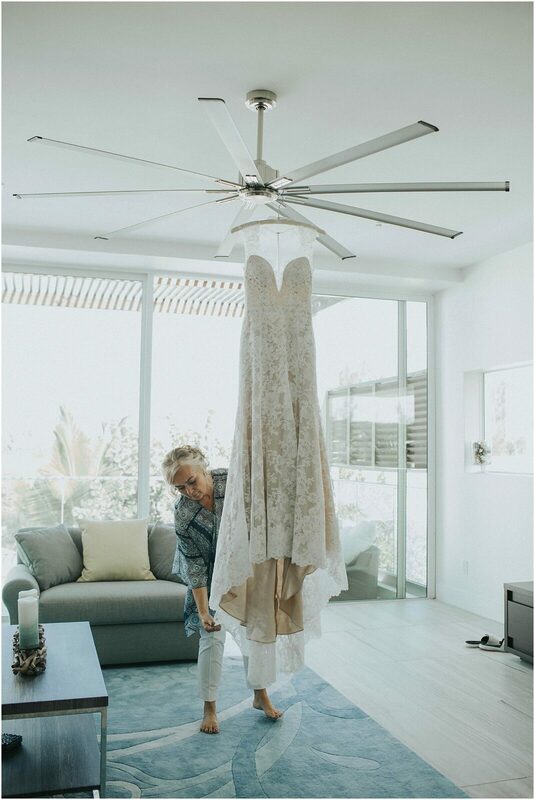 Guests were shuttled to the secluded beach where Kristin and Doug stood in front of 24 of their closest friends and family and said yes to forever with each other. 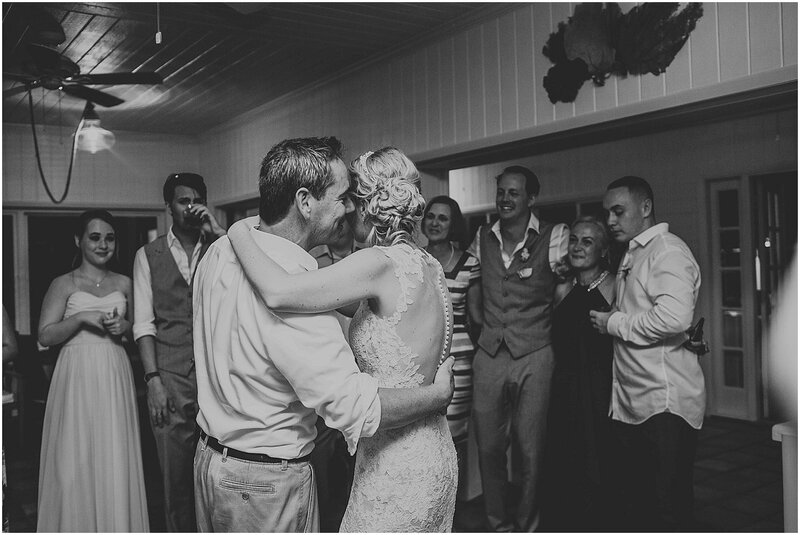 Kristin’s brother married them and it was perfect. 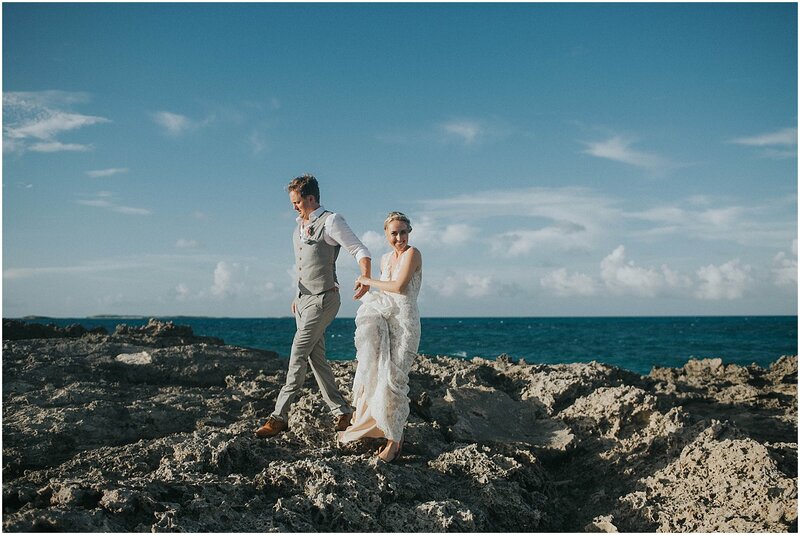 After the ceremony we explored the beach and surrounding areas capturing the island vibes and the effortless love between Kristin and Doug. 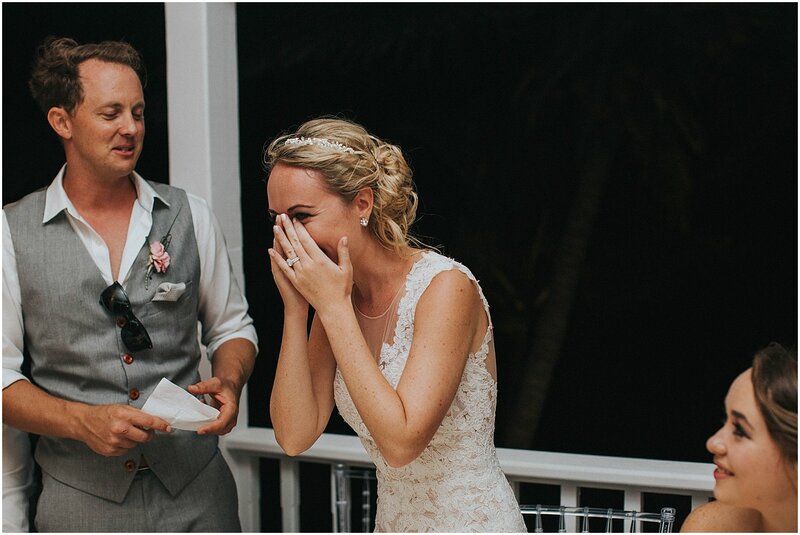 These two literally couldn’t stop smiling! 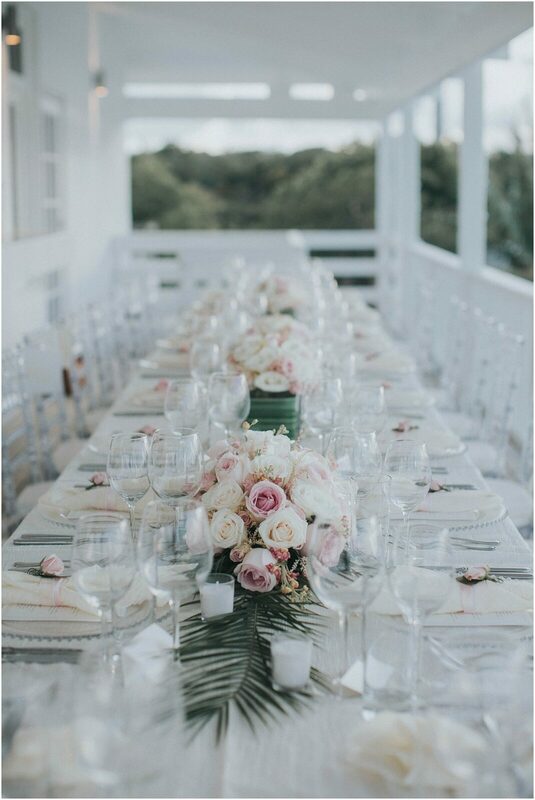 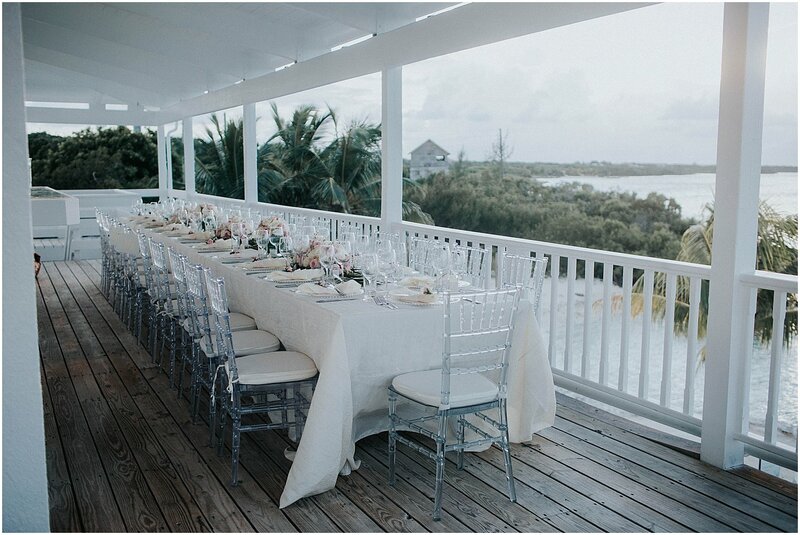 The reception was held at a beautiful bayside venue called Turquoise Cay where guests sat on a terrace overlooking the water. 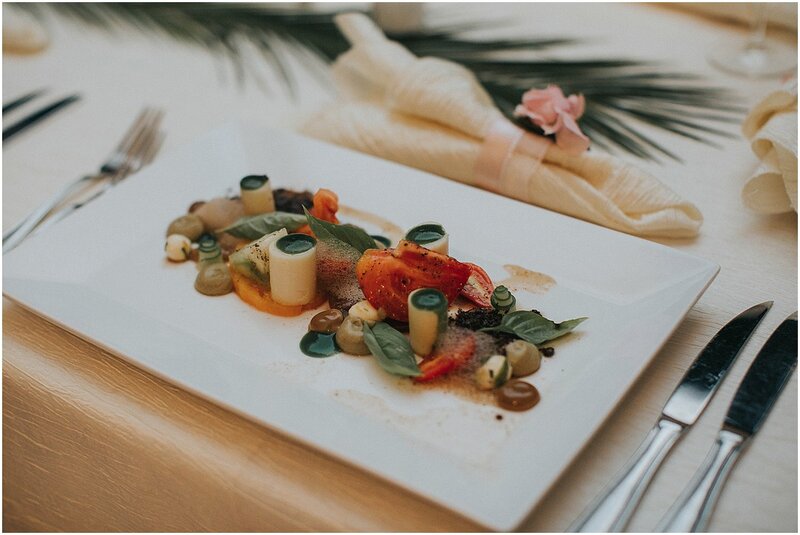 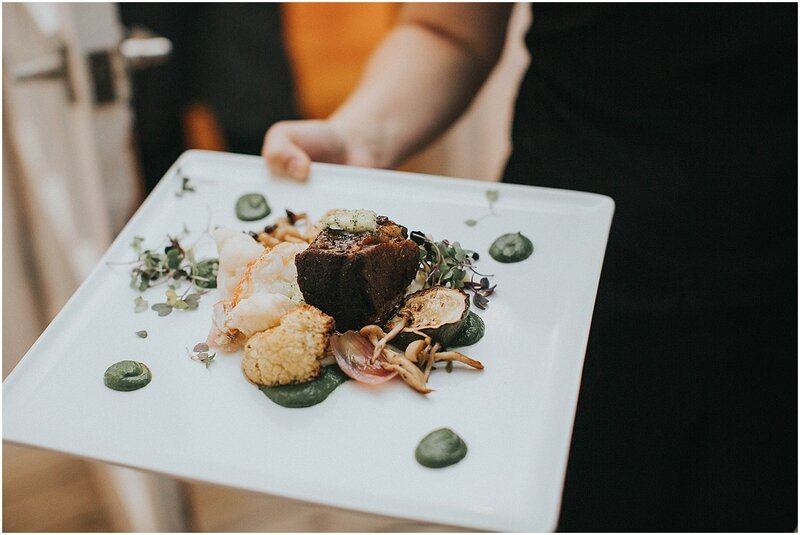 Executive Chef Tim Tibbits created a gourmet dinner alongside his wife Rebecca Tibbits (they own an amazing restaurant in Freeport called Flying Fish). 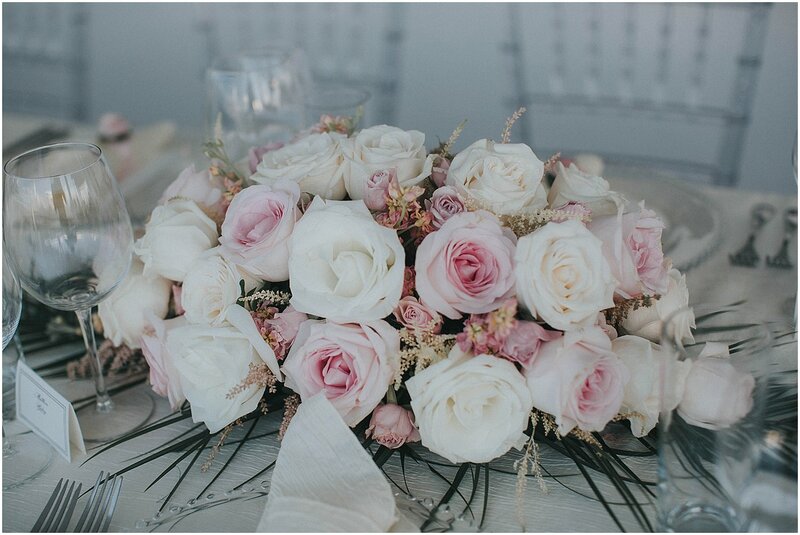 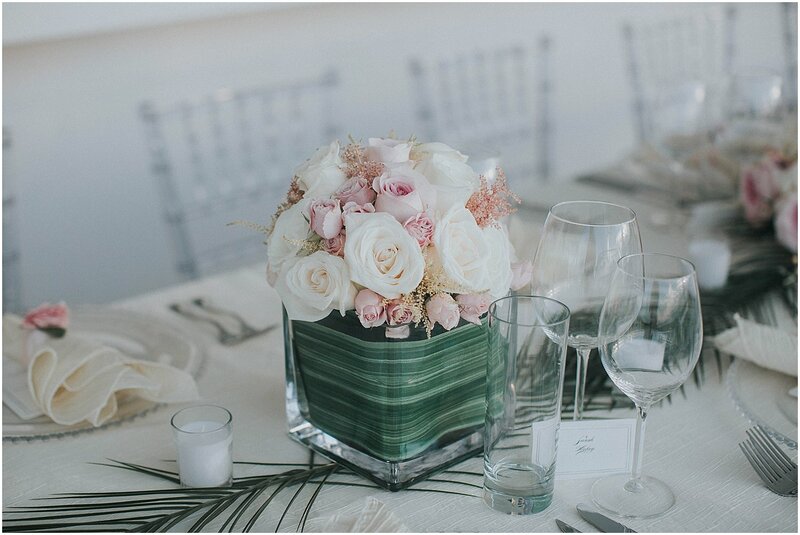 Guests sat at a table with gorgeous flowers by Augustin Faxas from Miami. 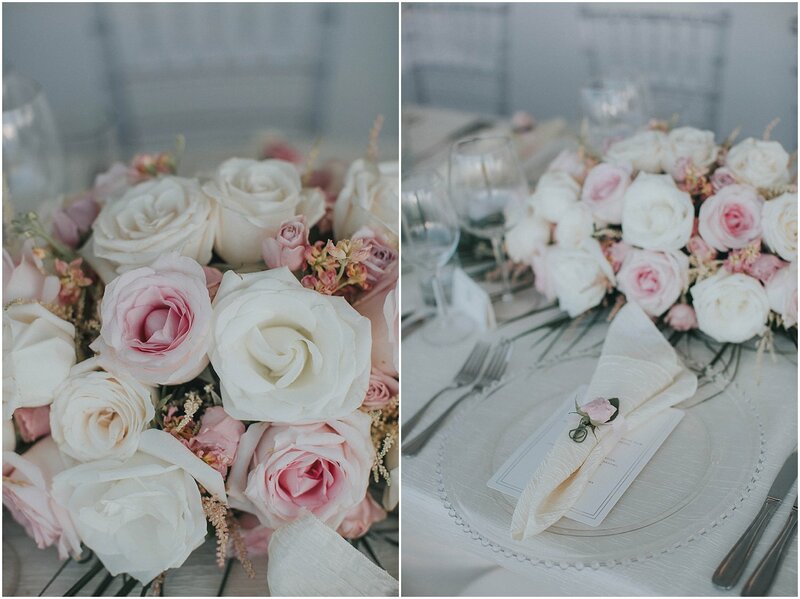 They spent the evening eating amazing food and chatting about the two amazing people who had been married that day. 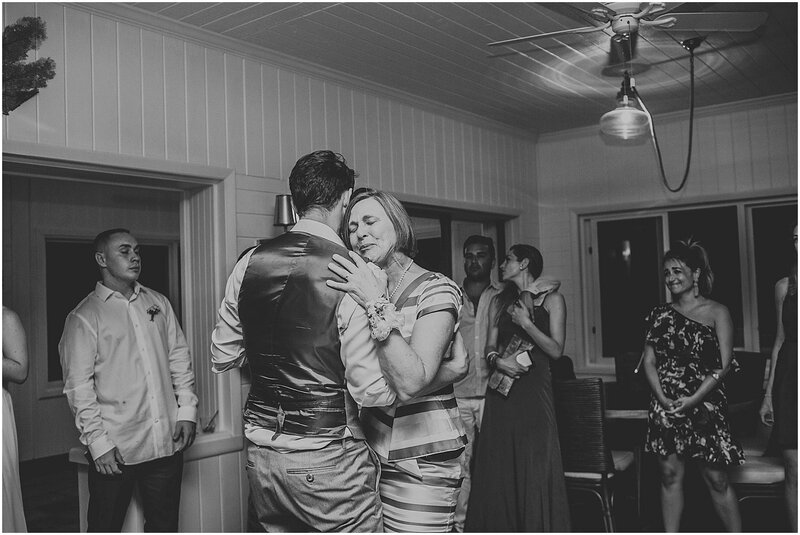 It just happened to be my birthday the day of the wedding and as much as I tried to avoid anyone finding out they did. 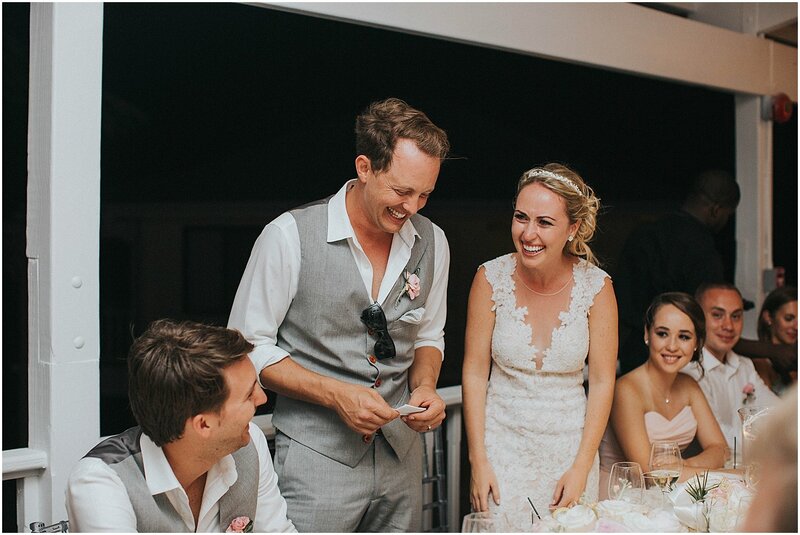 Everyone sang happy birthday to me as I sat blushing in embarassment ha! 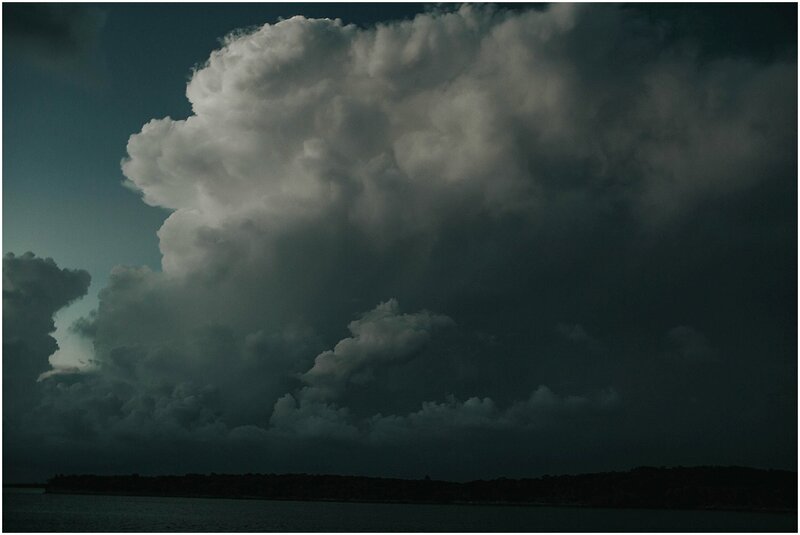 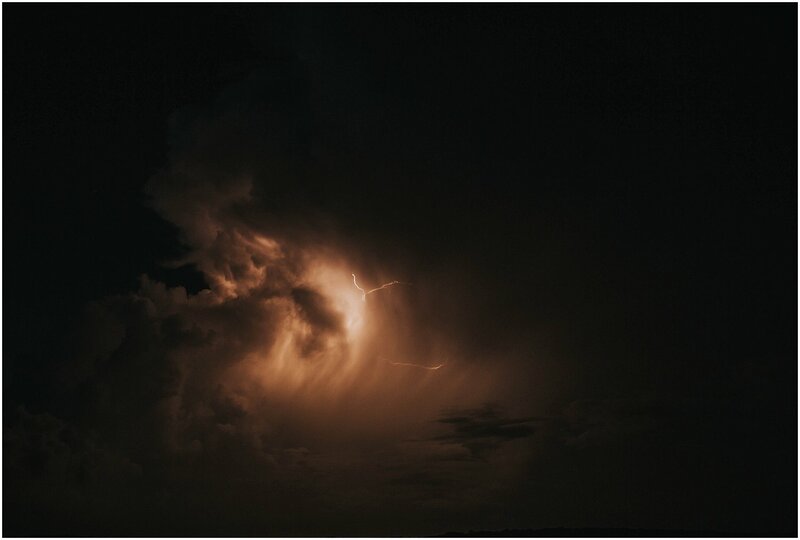 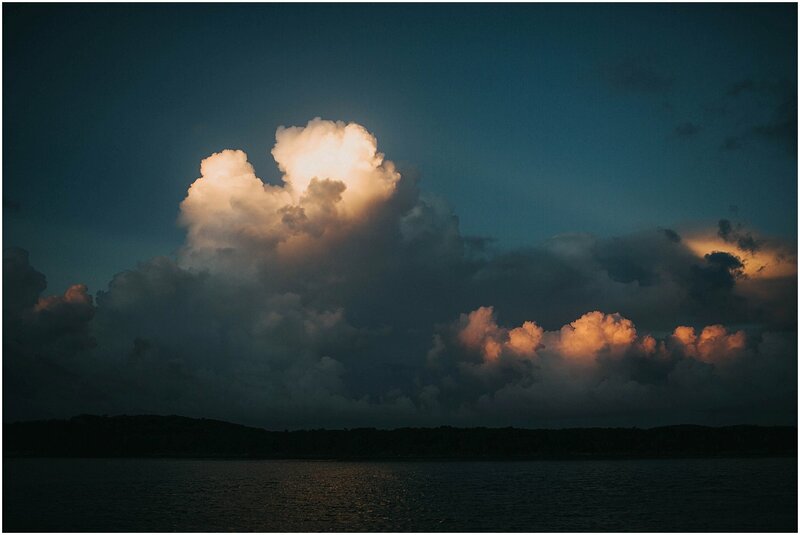 We also got to experience an amazing lightning show over the water from an intense storm offshore. 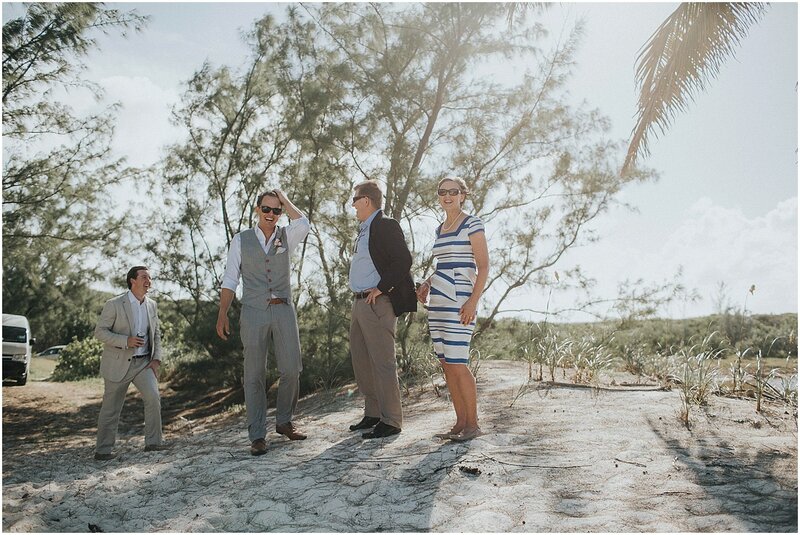 I am always grateful to the people who bring me along on these wedding adventures. 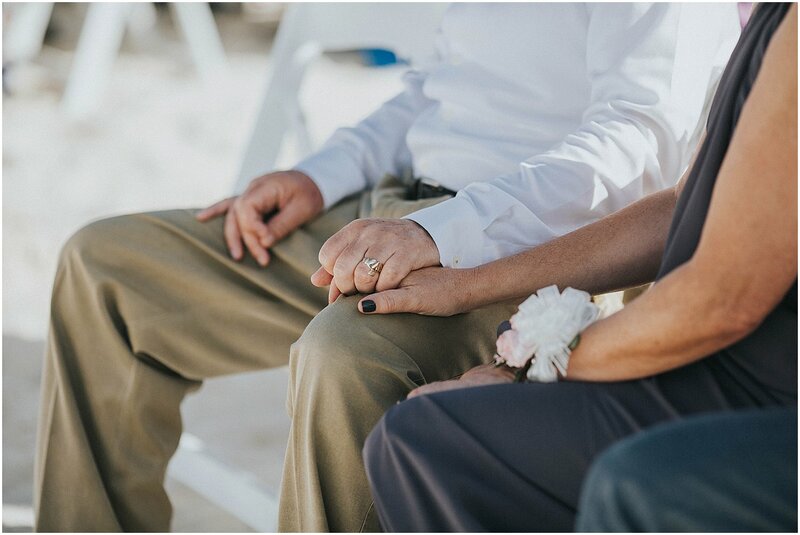 So many times I never get a chance to meet these couples in person or even speak with them at all. 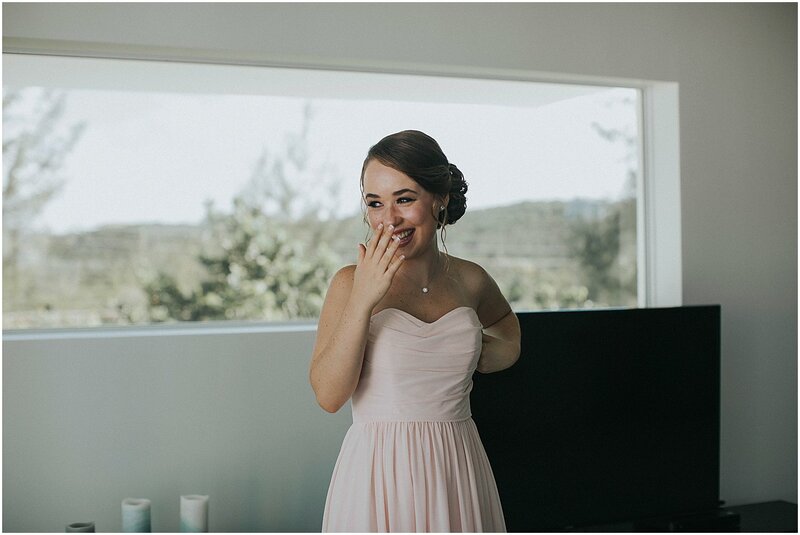 It makes me feel good that my imagery speaks for itself and makes them want to bring me along on such a special occasion.